This guide is brought to you by Visit NSW. Bellingen is one of my favourite places on earth. With a balance between hippie town and farming industry with beautiful lush greenery and an established food scene, it quickly casts a spell on visitors, many of whom are lured by the town's tranquillity and charm. The drive from Tamworth to Bellingen is only three hours but it's startling to see how the landscape changes. 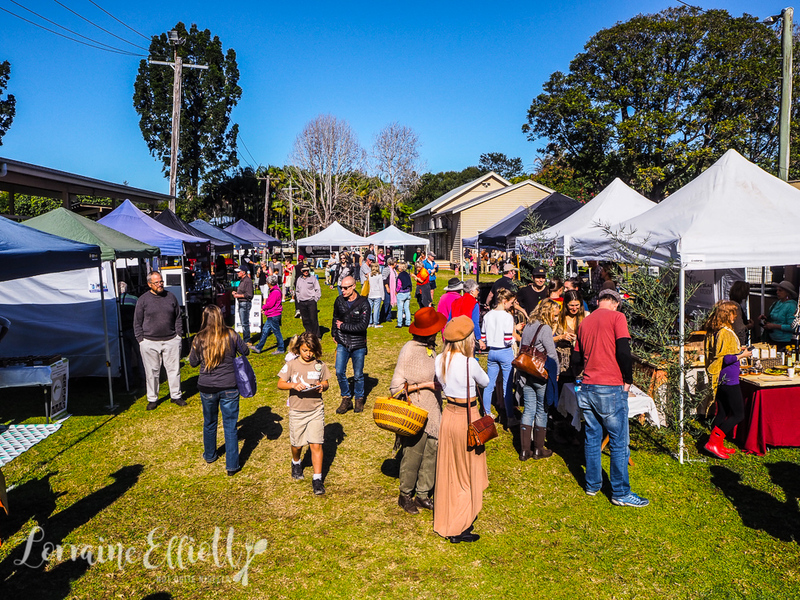 Bellingen revels in greenery and two kangaroos bounce across the road in front of us and farmhouses with lush green grass, fluffy white clouds and blue sky make it feel as though you are travelling through a bucolic painting. We are on our way to The Promised Land Retreat. 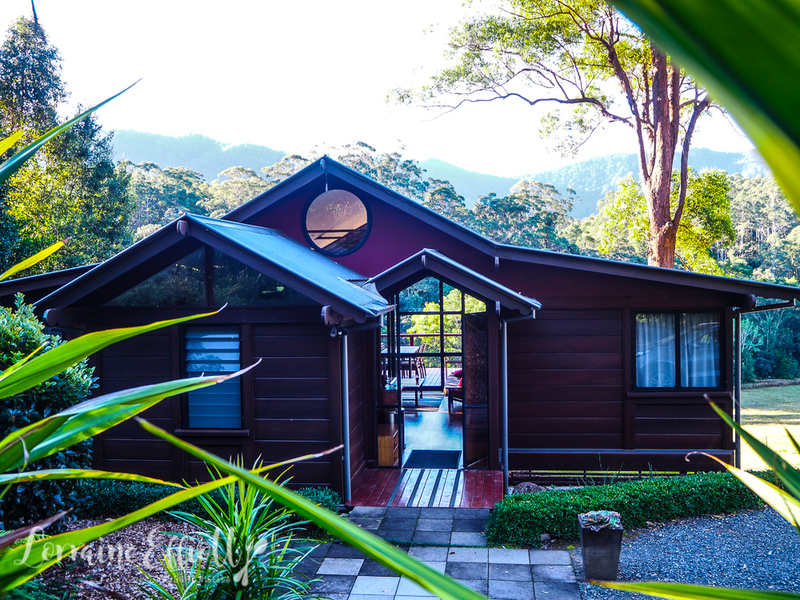 No, it's not a religious pilgrimage but a retreat in Bellingen that promises relaxation above all else. 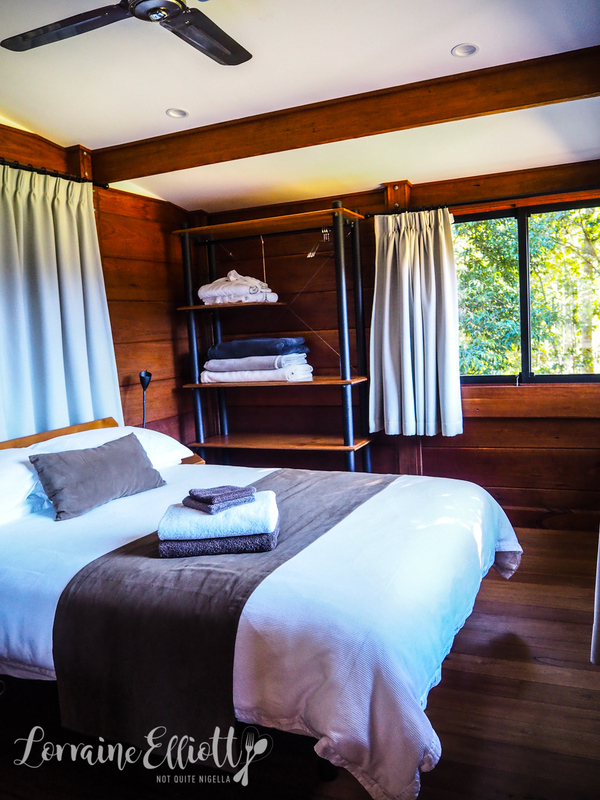 There are a total of just three chalets here on the 100 acre property and it is located about 20 minutes drive from the centre of Bellingen just below the great dividing range. The only noise you're likely to hear is birdsong. When I pull up and get out of the car a flock of bright, red breasted birds fly up high into the sky. 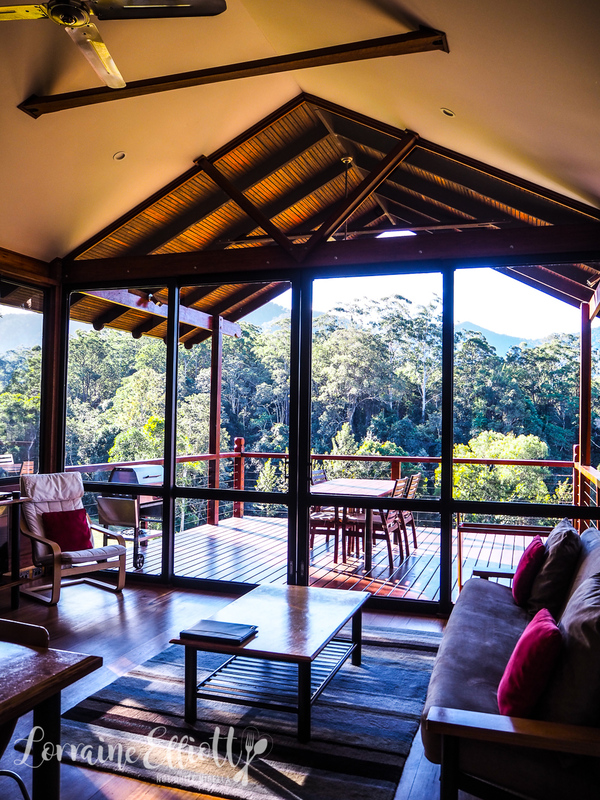 I open the door of the self contained timber chalet and it's all about the view. 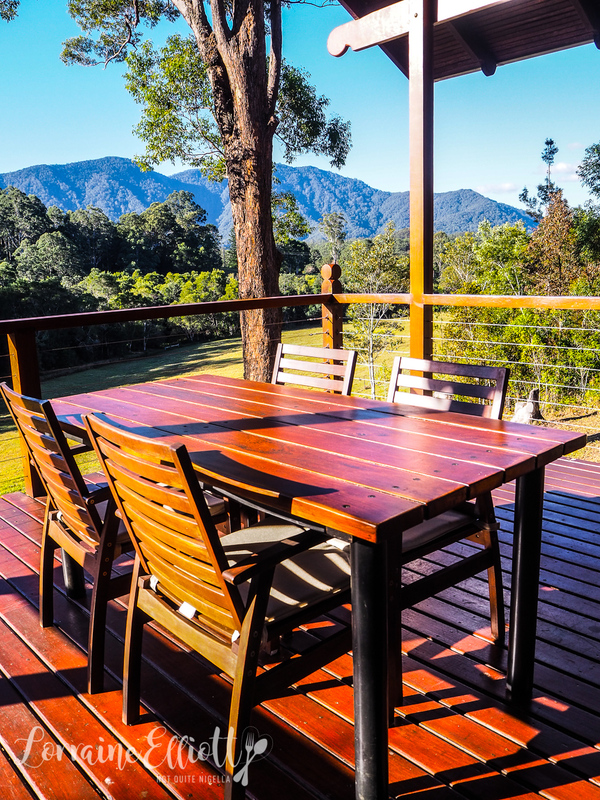 From the large timber deck there are panoramic views of the forest and a few minutes walk away is the river. The chalet we are staying in is called Tallowood. It has two bedrooms with queen beds. One bedroom has two single bunk beds added to it. There is a living room with fast and free wifi, a television with Netflix and Spotify and a fully equipped kitchen with pantry basics included as well as a water purifier. 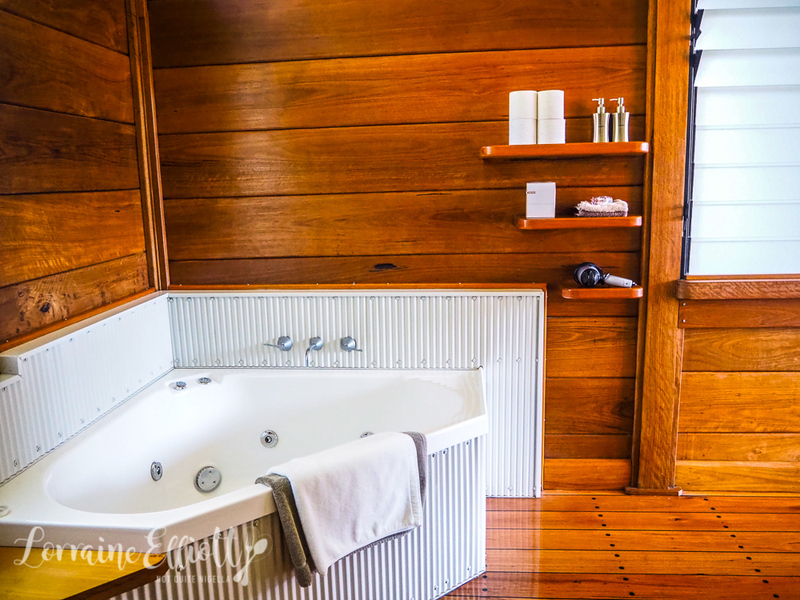 The bathroom is spacious with a freestanding shower, spa bath and environmentally friendly products on offer. 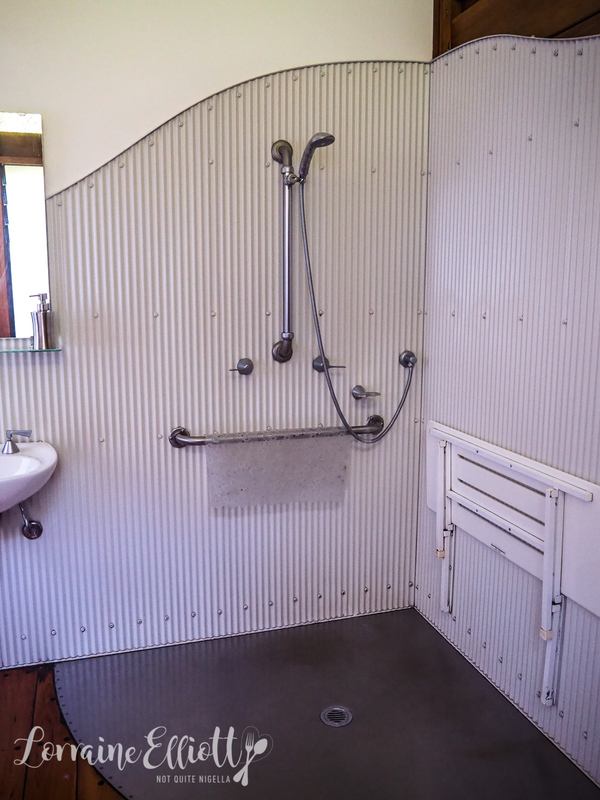 The shower does tend to spray all over the floor but it's nice and roomy. Shampoo, conditioner and soap are provided but you'll have to bring the rest. 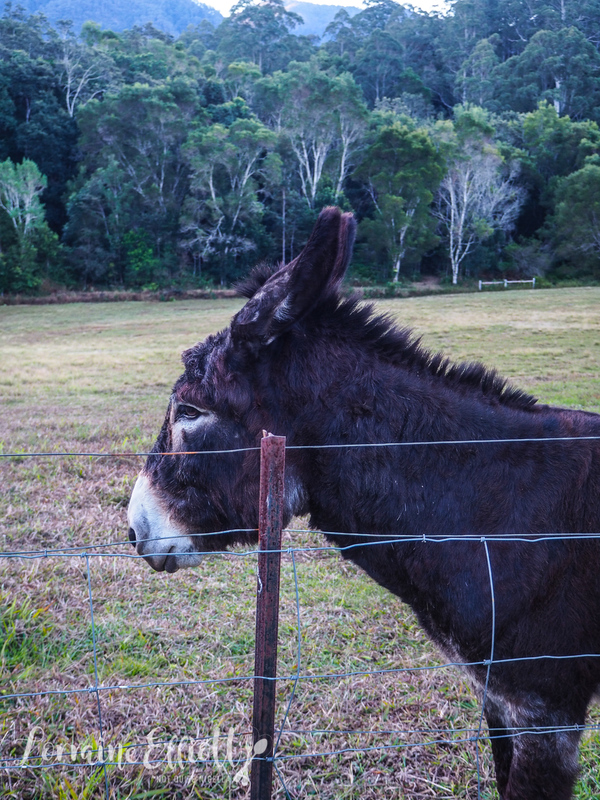 And if you're looking for something to do, there is a games room, mountain bikes and a tennis court as well as the two resident donkeys Zorro and Alby and a friendly horse. 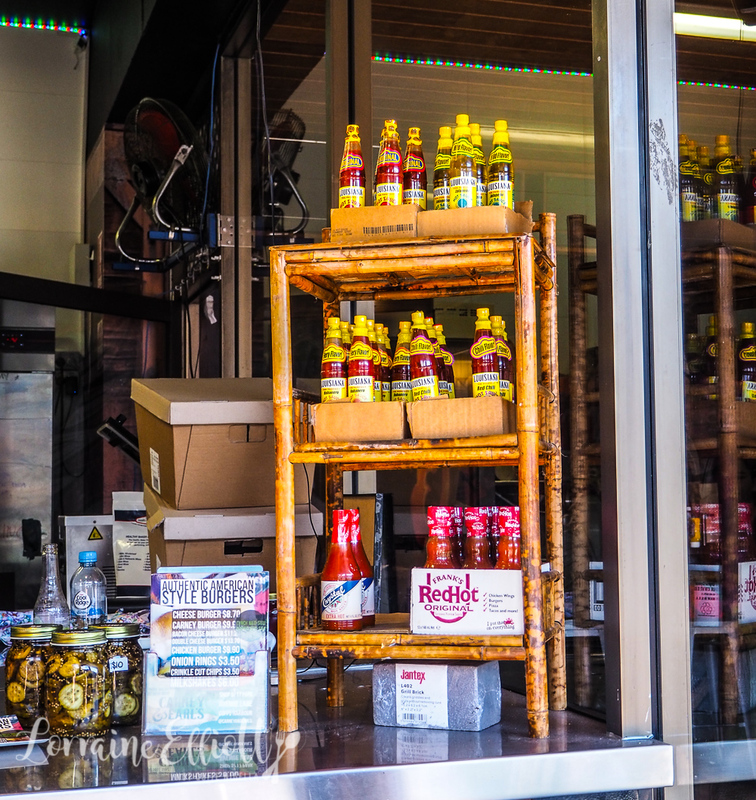 Lunch on the main street of Bello (Bellingen) offers many options. 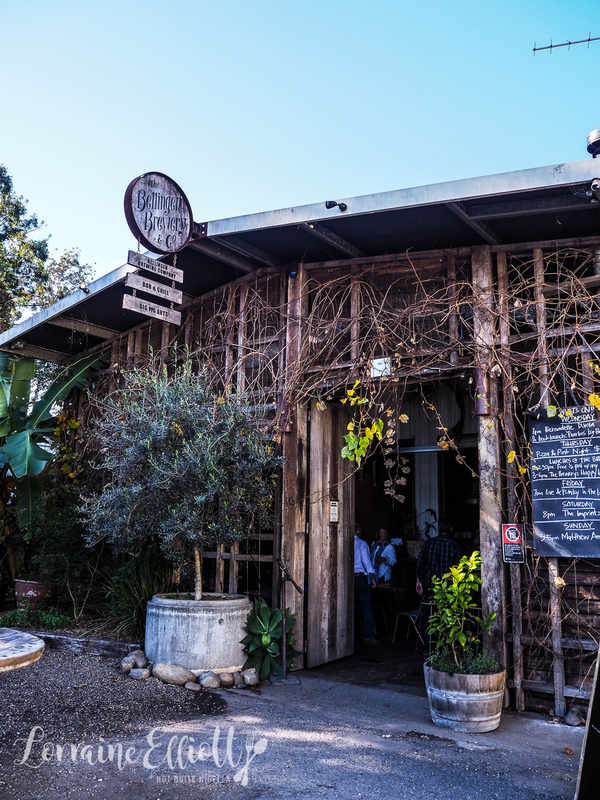 Bellingen has a well developed food culture mixed in with a hippie vibe. A busking trio play and people pull up a patch of grass and listen appreciatively. I think one of the best ways to really feel like you're on holidays is to eat fish and chips. 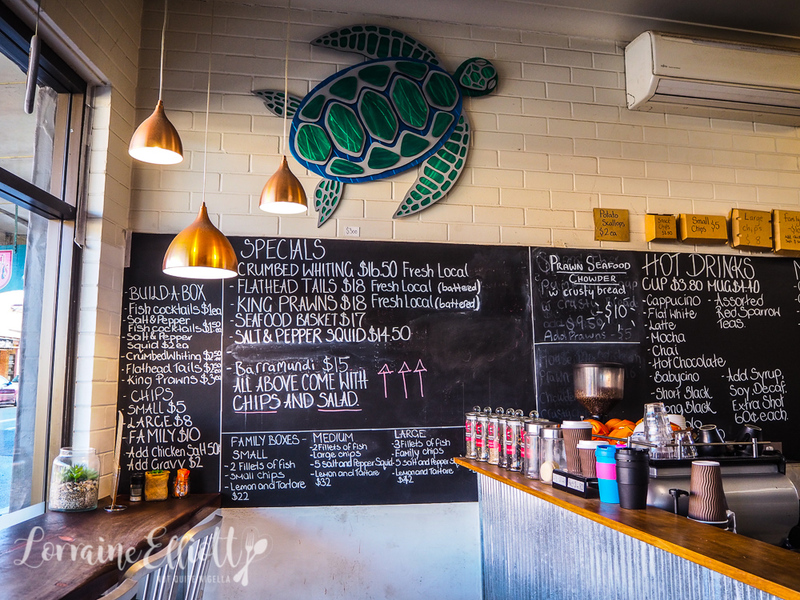 The Tuckshop on Hyde Street specialises in fresh juices and local fish. We try a Tuity Fruity with apple, watermelon and pineapple (divine) and a Veg Out with carrot, apple, beetroot and ginger (healthy). The seafood basket comes out and there are battered local flathead fillets, crumbed whiting, calamari and some absolutely terrific chips dusted in chicken salt. I also asked for a pot of gravy for the chips because why not (and it also comes with aioli). Sitting outside in the warm breeze I really do feel like I'm on holiday. 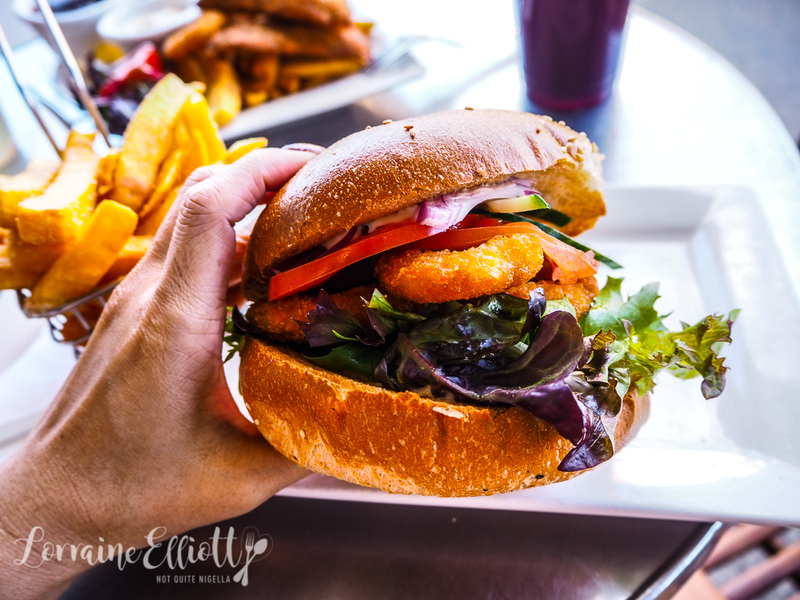 We also order the calamari burger, with lettuce, tomato and mayonnaise with crumbed calamari rings. It's tasty and comes with some of those moreish fries (they should come with a warning). There are also plenty of options for dinner. One relative newcomer is Popla from the same people from Newtown's Bloodwood. It's in the same building as the popular No2 Oak Street used to be. We are the first to arrive but come 7pm the restaurant will be full. The kitchen has a large hearth that you pass through on the way to the bathroom. 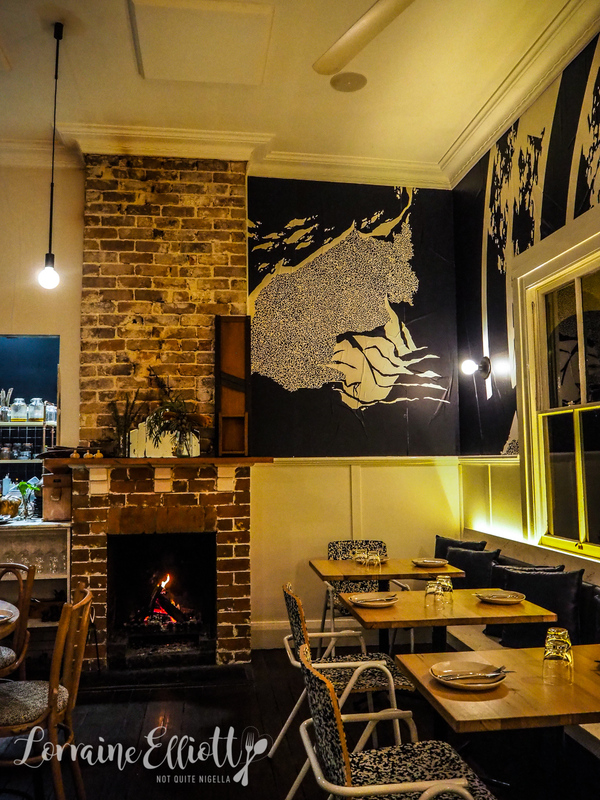 The menu makes use of many native ingredients and the wine list is all Australian. 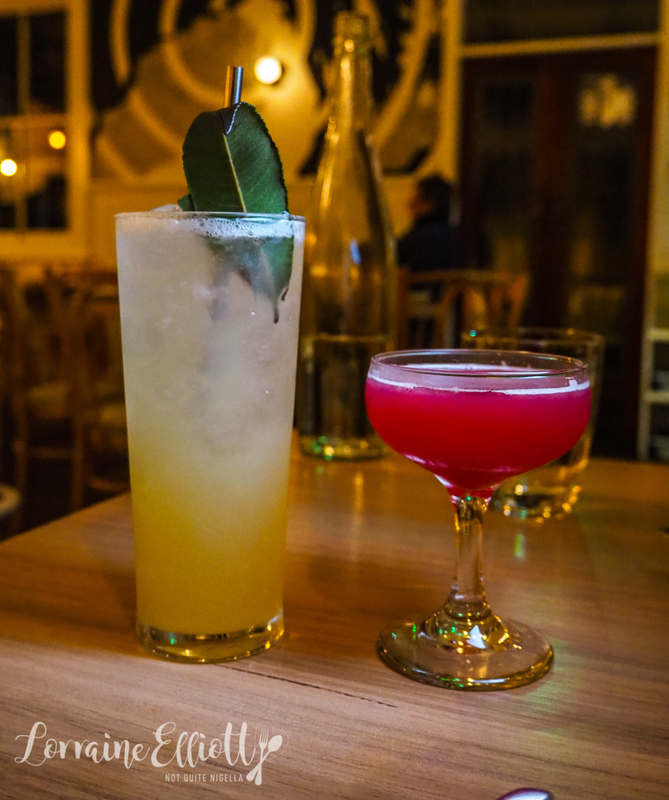 Service is friendly and we start with two cocktails, both making use of native Australian ingredients. The lemon myrtle Collins has gin, lemon myrtle and soda but with a strong eucalyptus flavour to it. The Davidson Plum Cosmo has vodka, house orange liqueur and Davidson plum syrup. The Hervey Bay scallops do a good job of getting the appetite going (not that this has ever been an issue, much the opposite in fact as I say writing this and eating peanut butter from the packet after dinner). 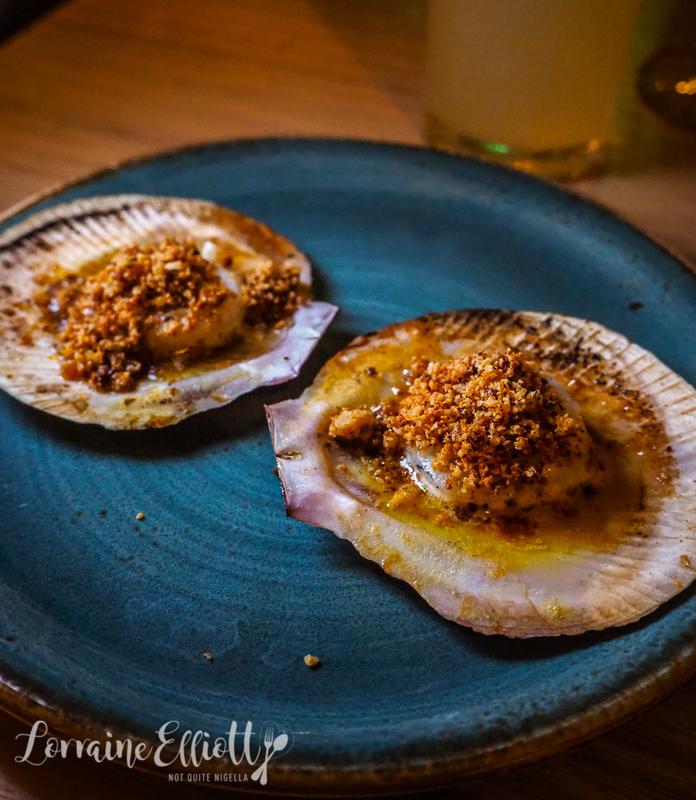 The scallops are served on the shell and grilled with miso butter and a garlic crumb. The next dish to come out is the smoked duck which is pretty fabulous. 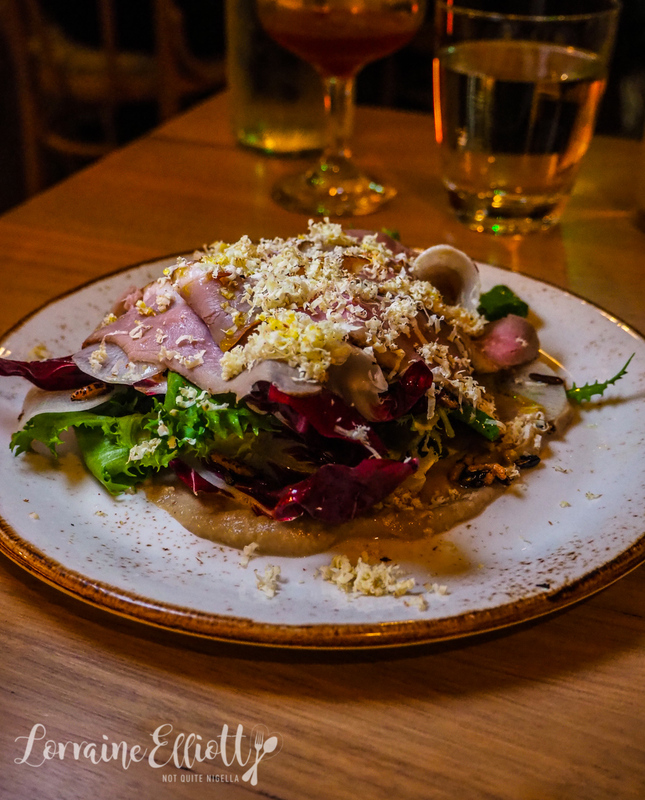 If you're a fan of charcuterie they do it all in house and this is layered on top of daikon, puffed rice, chestnut and a mild, slightly grainy mung bean buttermilk. My favourite part of this is the thinly sliced duck. For once, Mr NQN has tried an ingredient more than I have. It's a bunya nut which he used to eat roasted as a kid and he recalls it having a sweet flavour. 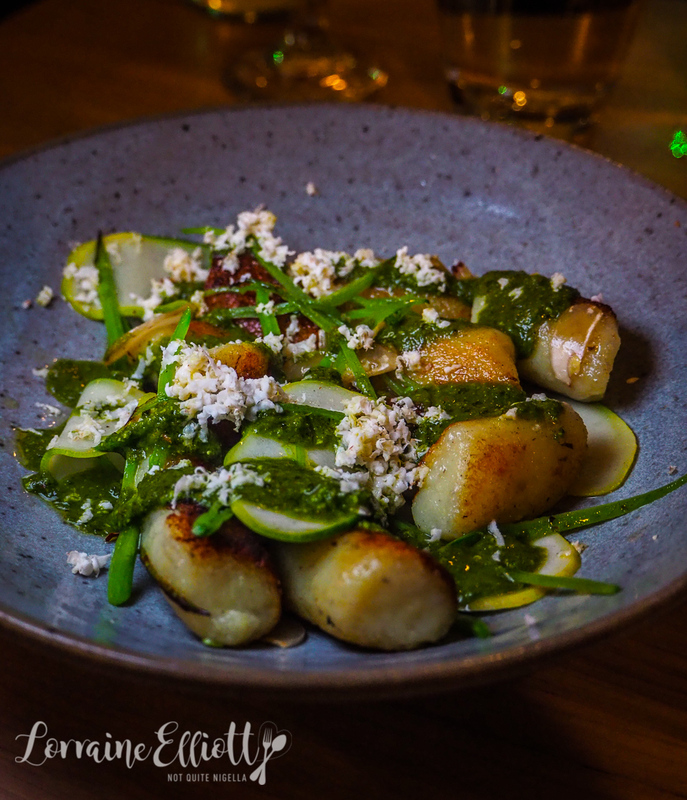 In the gnocchi it's not readily discernible as a flavour, especially with strong flavours like basil, snowpeas and heirloom squash but the gnocchi has a nice crispy edge from being pan fried. The next dish is both our favourite. Although simple sounding, a plate of sausages and polenta no less, it's so utterly comforting. 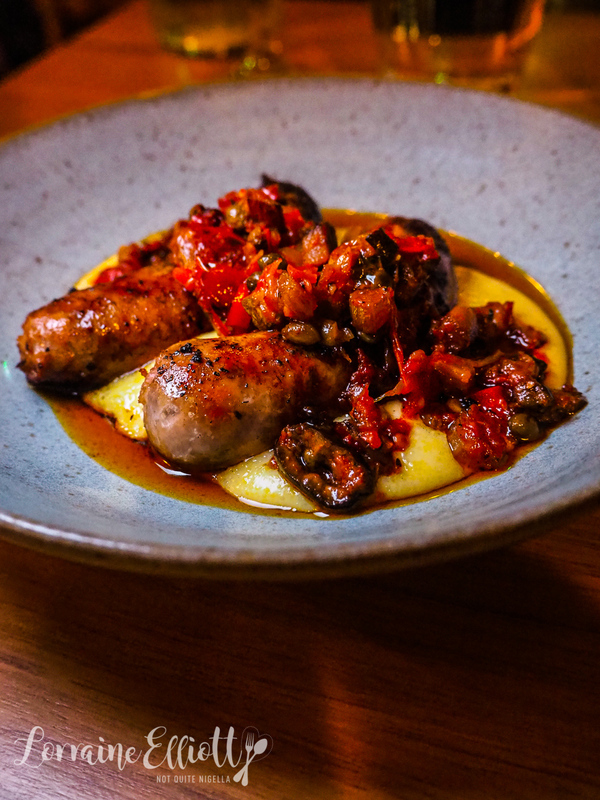 There are two house made pork and fennel sausages on a bed of soft, cheesy polenta with finely diced caponata that has a pleasing chilli tingle at the end. I could easily eat the whole thing myself it was that good. Then comes the last dish, the main. It's a Mount Cotton wood-fired half chicken that sits atop a crispy radish and rice cake with a blood plum and leek sauce. This dish has almost Asian flavours to it for me or perhaps it's the crispy rice. 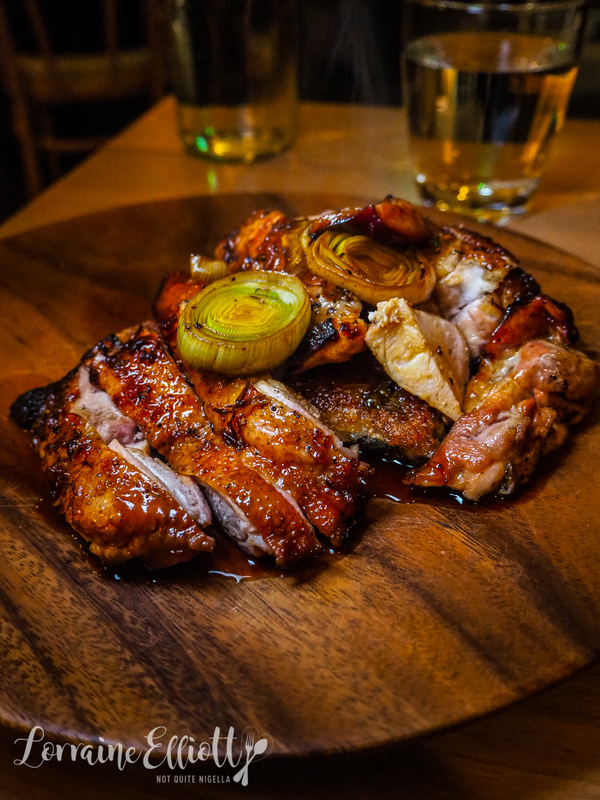 The chicken is very tender and texturally it's a good contrast to the crispy rice cake. We decide on two desserts this evening. 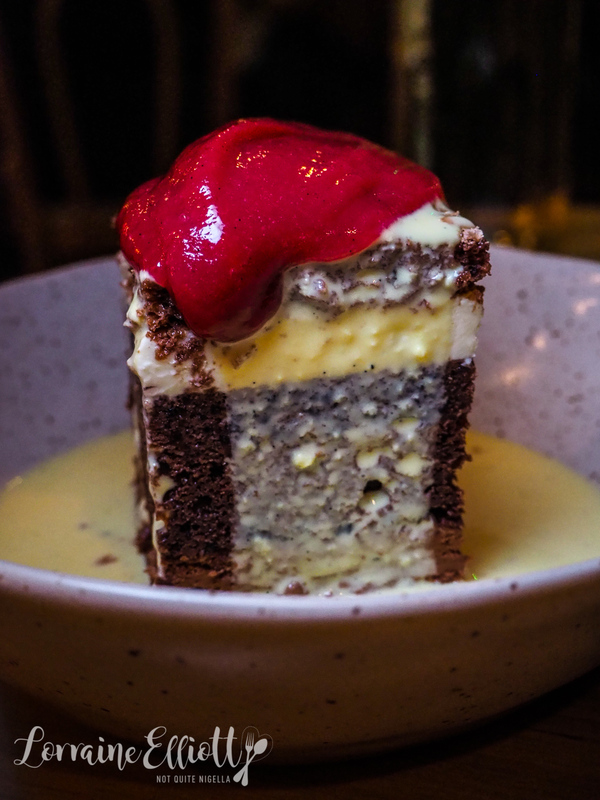 First is the restaurant's signature dish, a dark chocolate trifle cake which has cake alternated with a chocolate mousse with a champagne anglaise and a smooth, pureed rhubarb dollop on top. While this was nice, parts of the cake were a bit dry. 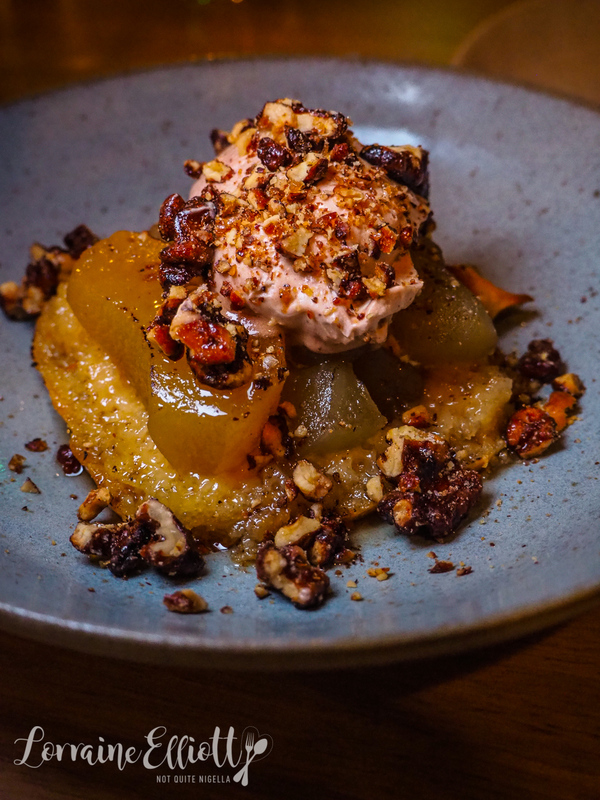 However we both swooned over the puffy brioche round, topped with tender Kanzi apple slices, fermented honey, quince cream and candied walnuts. You know a dessert is good when you both fight for spoonfuls of it until the very end. After a great night's sleep (honestly, I always thought I was a city girl but I do love the peace and quiet), we wake and head back into town to the Old Butter Factory for breakfast. There is an indoor area but as the day is warm we take a seat in the large outdoor area and fawn over the dogs. Housed in a historical building first opened in 1906 the factory used to produce 3/4tonne of butter in its first week. In 1919 a bacon factory was added to the site and it was since rebuilt in 1926 to become the structure that stands there today. 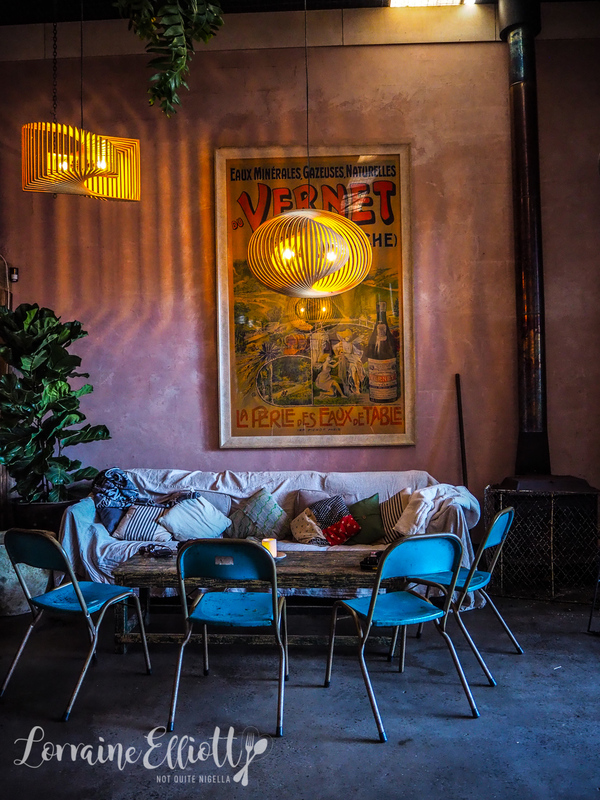 By 1963 butter ceased production and it was converted to a private residence but now it is the home to a cafe as well as a complex of homewares shops. Service is easy going and friendly and they have blankets for people sitting outdoors. We order a delicious chilli hot chocolate to warm up as well as two frappes. The first is a coconut milk, pineapple juice and fresh mint frappe which is good as it is refreshing but not too sweet. I also love the fresh watermelon and pineapple frappe on offer. Food comes out remarkably quickly and the food is a rather impressive size. 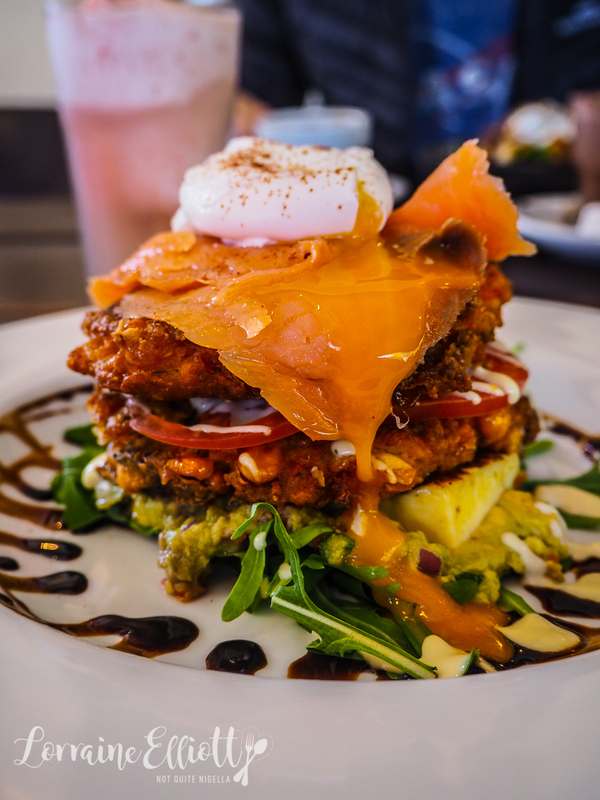 The corn fritter stacked has turmeric corn fritters with sliced tomato, grilled halloumi, avocado salsa, aioli, poached egg and our addition of smoked salmon. It's enormous and very tasty and try as I might I can't make a dent in this mountain of corn fritters. 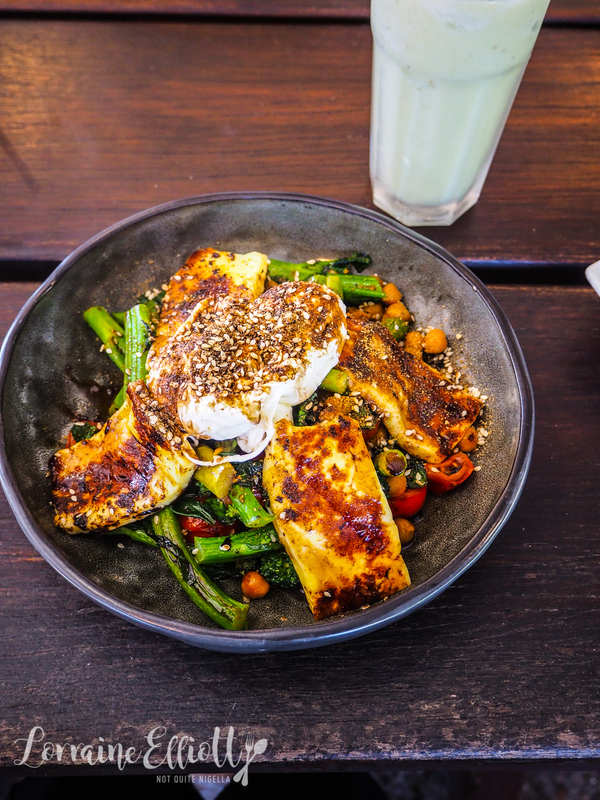 What effectively is a stir fry for breakfast is the Clean and Green with sauteed spinach, asparagus, broccolini, spiced chickpeas, pesto, grilled halloumi, cherry tomatoes and poached eggs with dukkah. 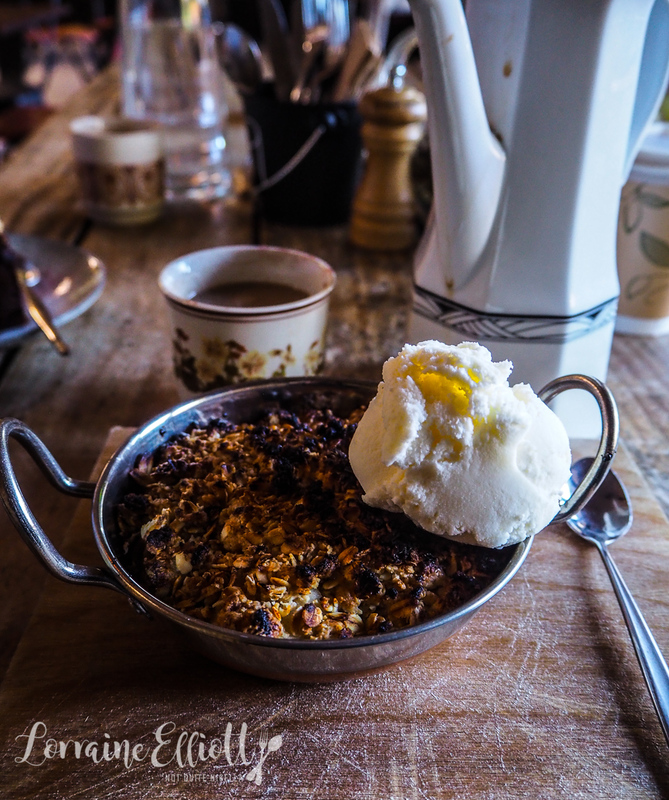 It's delicious and full of flavour and I'm behind any sort of dish which is like dinner for breakfast really. The locally baked bread is from the local bakery Hearthfire just off the main street. 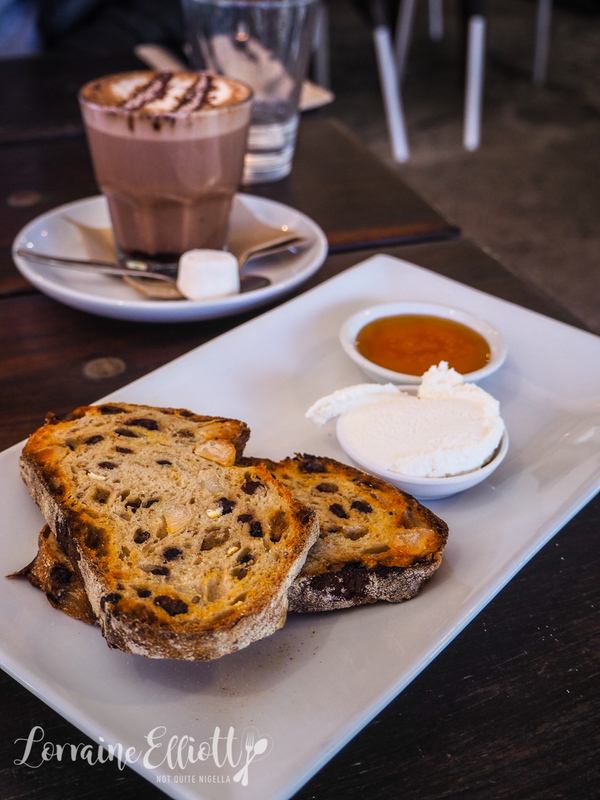 It's a macadamia fruit toast with infused honey and ricotta. I have this with a wonderfully spicy chai latte that has a nice peppery finish to it. 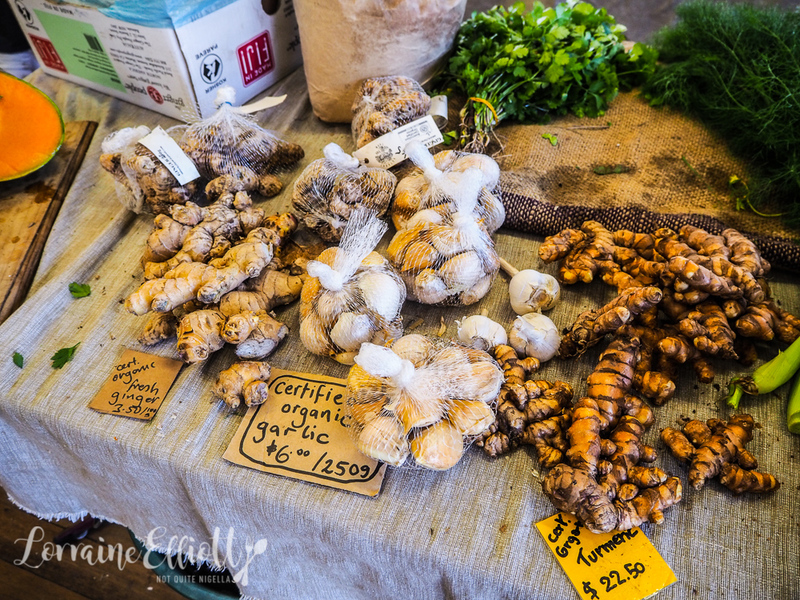 We take a drive to the showground to take a look at the Bellingen Grower's Markets. Last time we made quite a few purchases but this time I have to be more conservative as I don't have a lot of luggage space. It's a mix of bric a brac, clothing but mostly produce with some of it organically grown. The hemp popcorn is delicious. Having just eaten breakfast we bypass the food offerings (tofu pockets, chai tea and baked goodies) and try some buffalo milk products including a buffalo feta and yogurt. 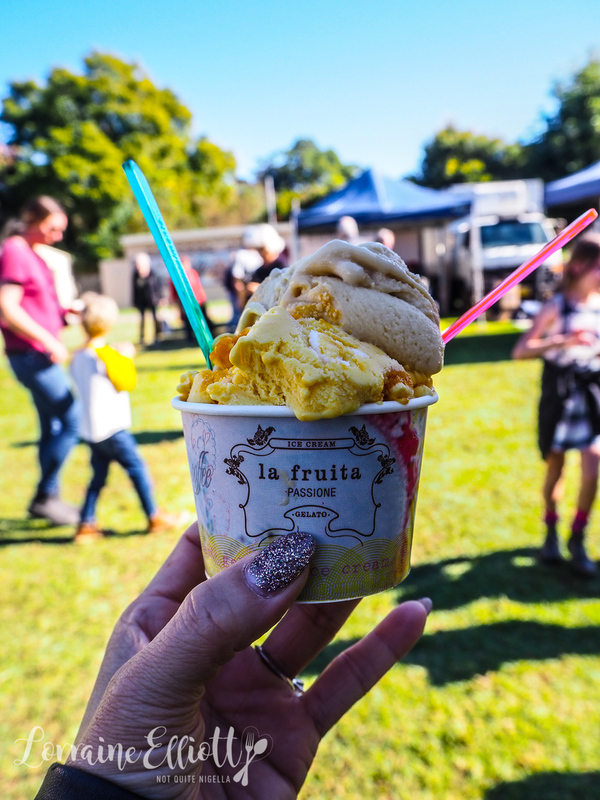 They also make their own gelato and we get a cup with mango and salted caramel gelato which is delightful. Mr NQN tells me stories of his years spent living in Bellingen from age 7 to 10. We head back to town for a spot of shopping. 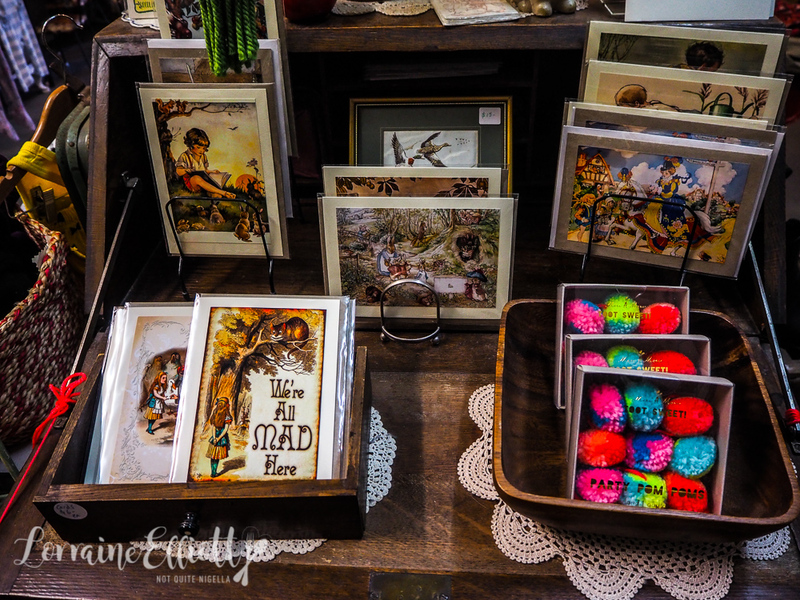 There are quite a few stores to browse through and I find a candle and a skirt at Vivid as well as some gifts. I buy some activated charcoal for a recipe from a health food shop. 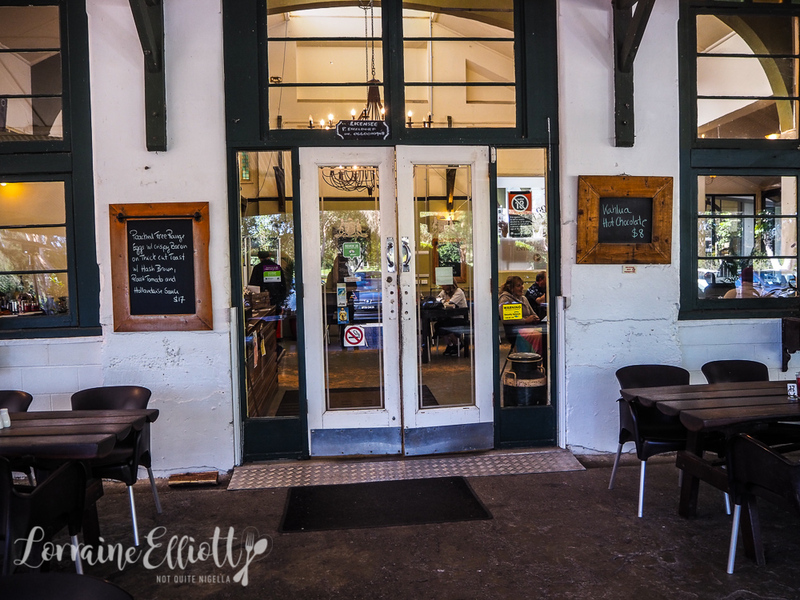 We then head to the Bellingen Brewery tucked away in a little back street. Most of the beer is brewed in partnership with the New England Brewery but the ginger beer (which is pretty terrific) is brewed here on the premises. 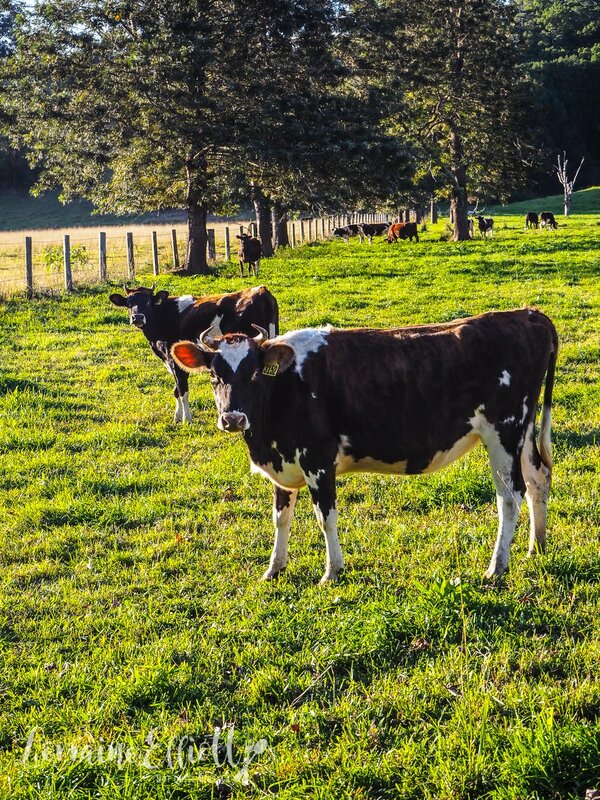 The whole proposition with Bellingen Brewery is that it is as environmentally sustainable and local as possible. 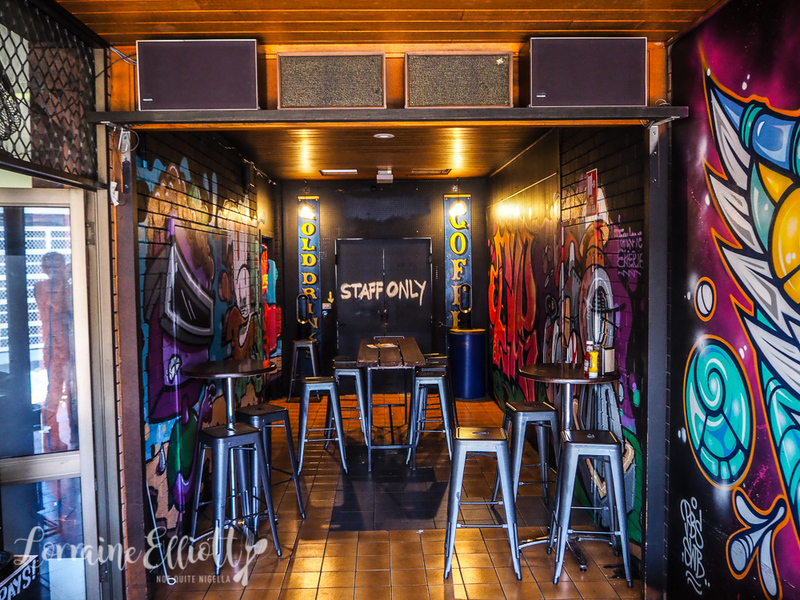 This means that the bar is made of recycled materials and they try to minimise waste as much as possible. There are no bottle products apart from outside wine, no disposable straws and all produce is compostable. "The only things we waste are wine bottles," they say. 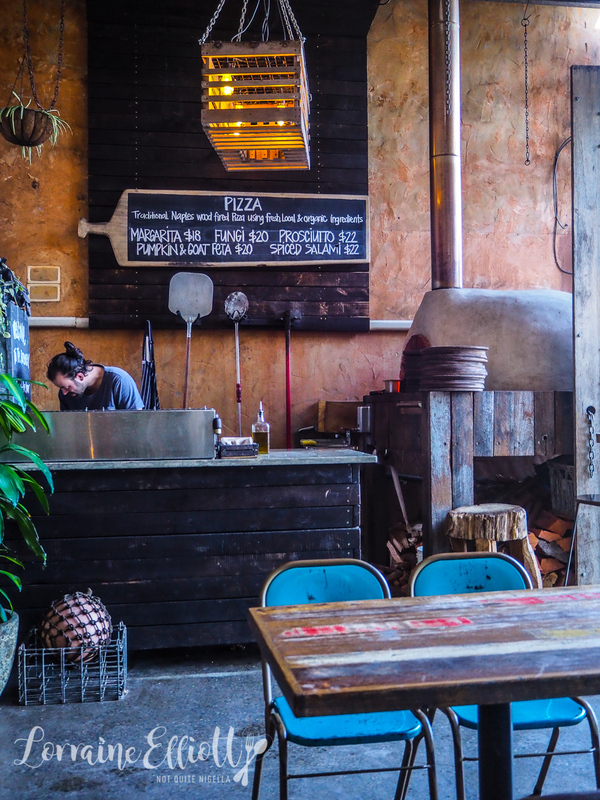 The brewery also has small snacks and Napolitana style wood fired pizzas made with single origin, non GMO unbleached flour from Tamworth, olive oil from Moree and a locally made mozzarella. Wash these down with a schooner of their Blonde, pale ale or Porter or that gorgeous ginger beer. 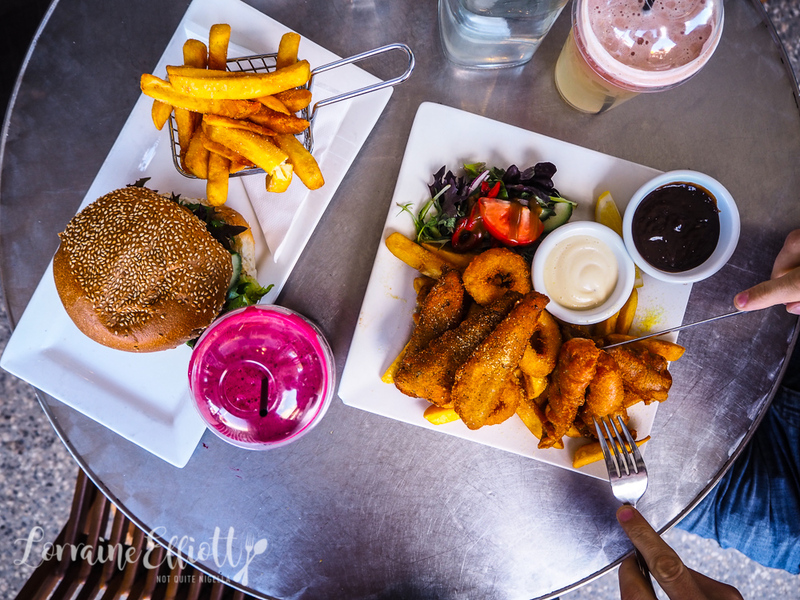 Shopping does work up an appetite and we stop for lunch at 5 Church Street which is just behind Bellingen Brewery. 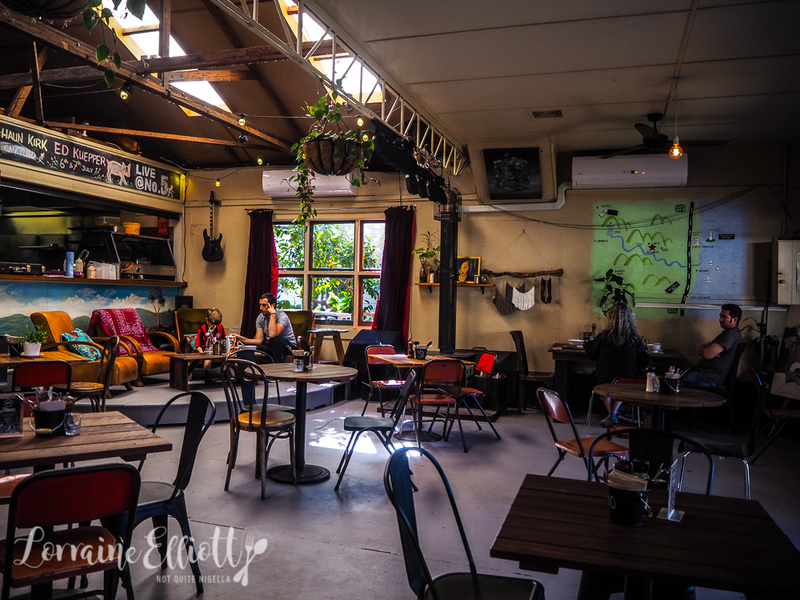 It's a cafe during the day and a live music venue at night and we had previously visited at night for a drink so we are curious to see what their food menu is like. 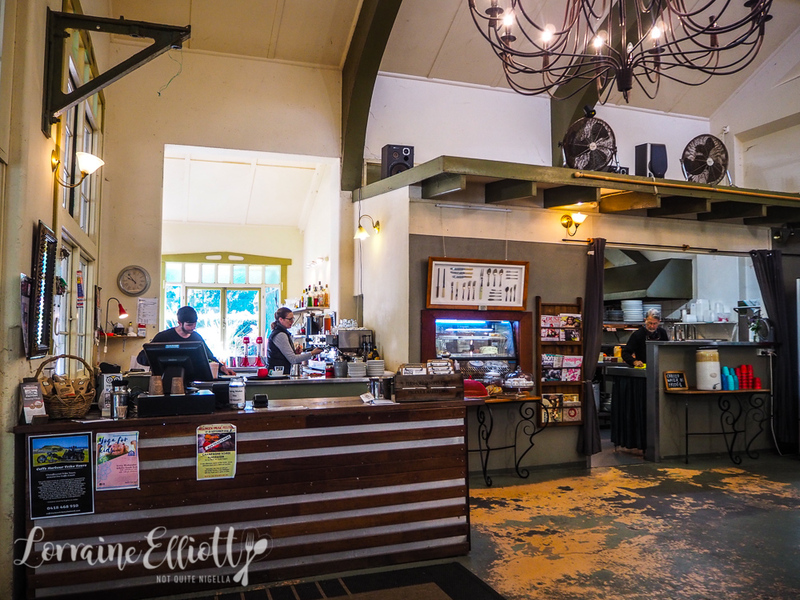 Part of the reason why I think I could easily live in Bellingen is easy access to chai lattes. I live for chai latte and here they're known for their Ritual Chai (there are signs asking people to ask for a sample of it). It comes in a large vintage tea pot that has enough for 4 cups of chai and it is made with soy milk, yet is creamy and spicy. 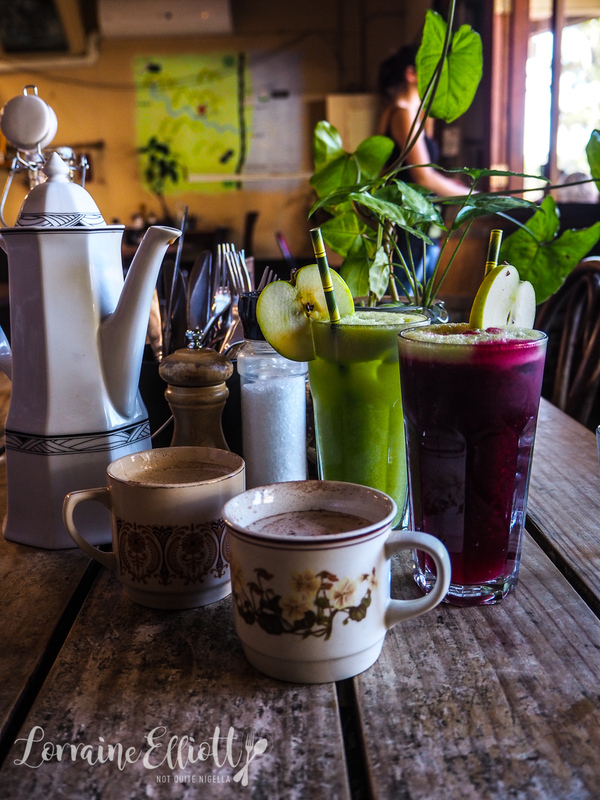 For good measure we also order a couple of fresh juices as the day has warmed up nicely. There's the Good Juice with apple, carrot, beet and ginger as well the apple, mint and ginger juice which is super fresh. 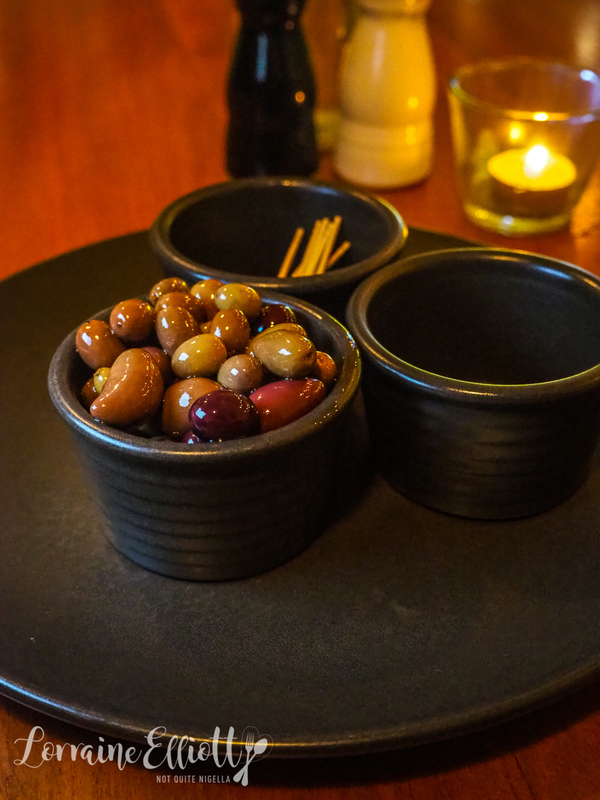 Although they are known for the fish and chips we feel like something lighter. 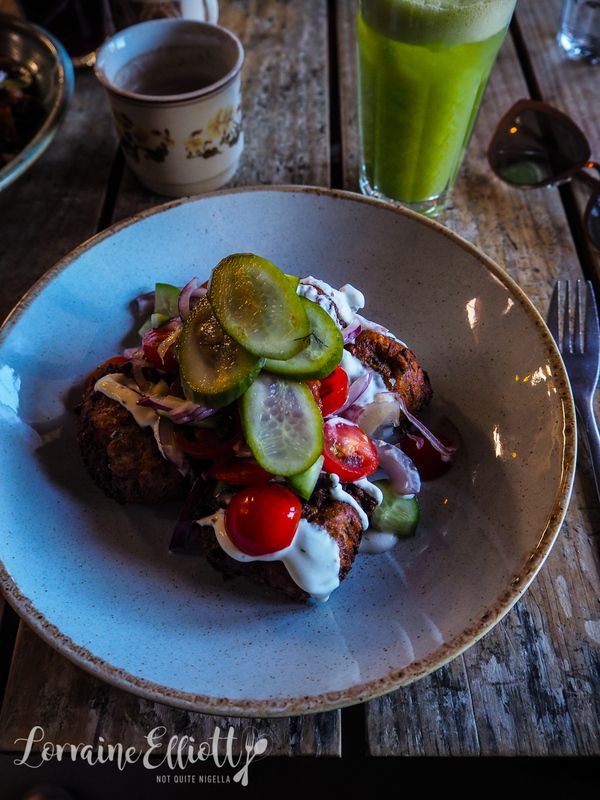 The zucchini and ricotta fritters are super light in texture and served with a garlic yogurt sauce and tomato relish. I would have loved a tad more relish but they are very good. 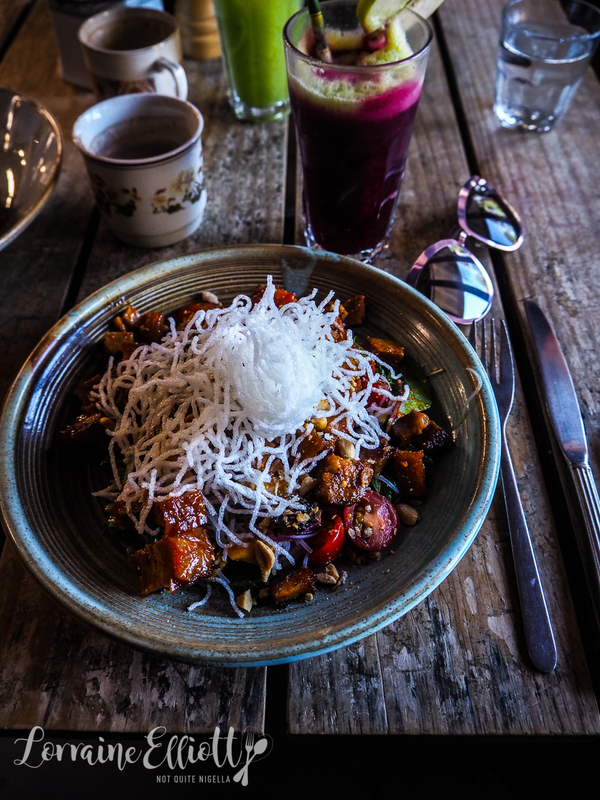 I am rather besotted with the sticky pork and mango noodle salad with sticky marinated pork belly cubes, vermicelli noodles, toasted peanuts, halved cherry tomatoes, mango salsa and nam jim dressing. 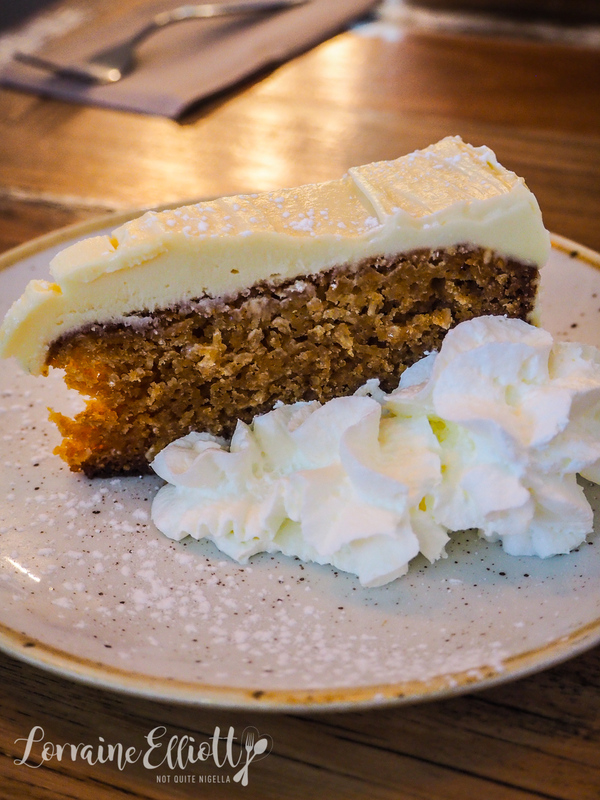 The carrot cake is quite nice and served with a dense cream frosting. We take the drive back to the Promised Land Retreat via an alternate route and Mr NQN picks wild lemons from a tree on the side of the road. I adore wild lemons, with their endless seeds, nubbly skin and copious amount of juice. I also love staying a bit away from town as it feels like a real retreat and that you're having a real holiday. But at night, it can be a challenge driving down the unfamiliar twisty roads. 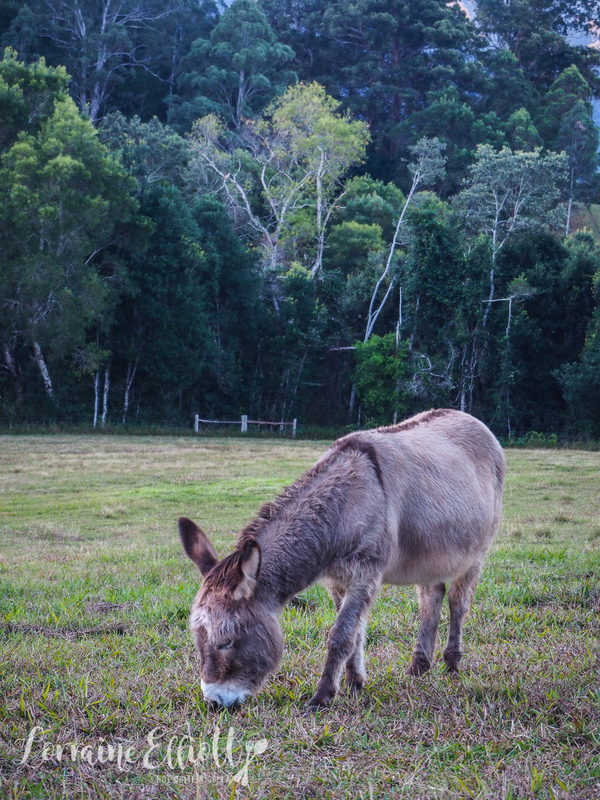 We go down to the paddock to pat the horse and the two donkeys Zorro and Alby. Zorro is more bold coming over for a pat and Mr NQN scratches his back which Zorro enjoys for a good 10 minutes! Then we head to the games room to play ping pong (it's the only sport in which I can match or better Mr NQN - genetics and all ;) ). 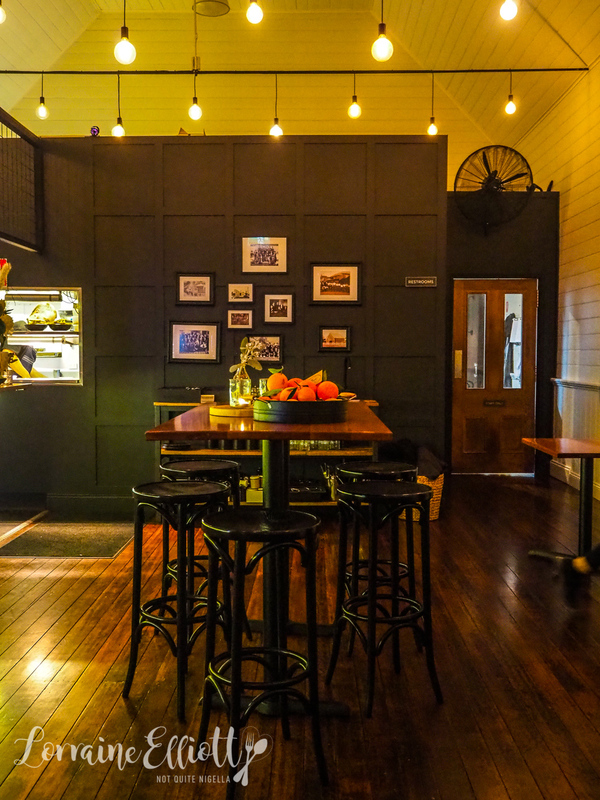 Dinner that evening is at Cedar Bar and Kitchen, back on Church Street in Bellingen. 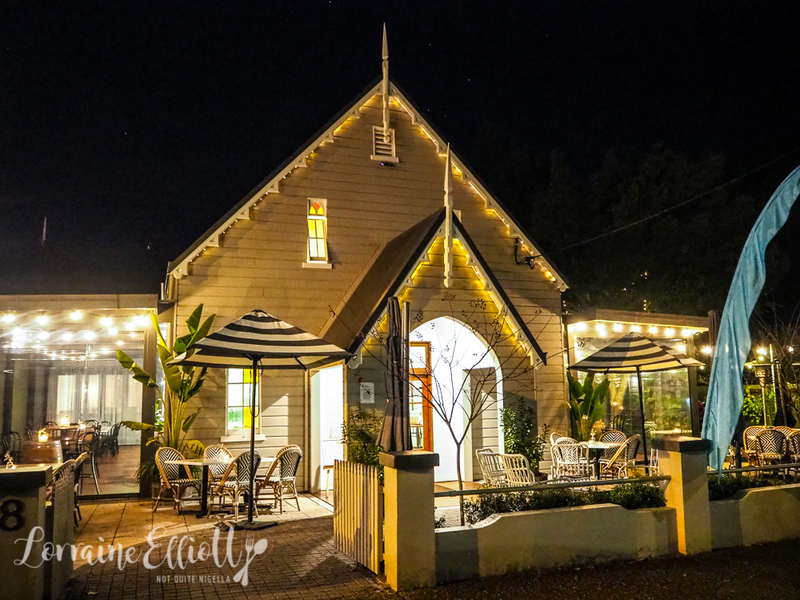 Named after the industry that kickstarted Bellingen (ironically logging), Bellingen was established when the nearby Fernmount mayor refused to open a pub, but the Bellingen mayor allowed this and it became the area where the workers settled. Cedar is located in a converted church that used to originally sit on the corner of Church and Hyde streets. 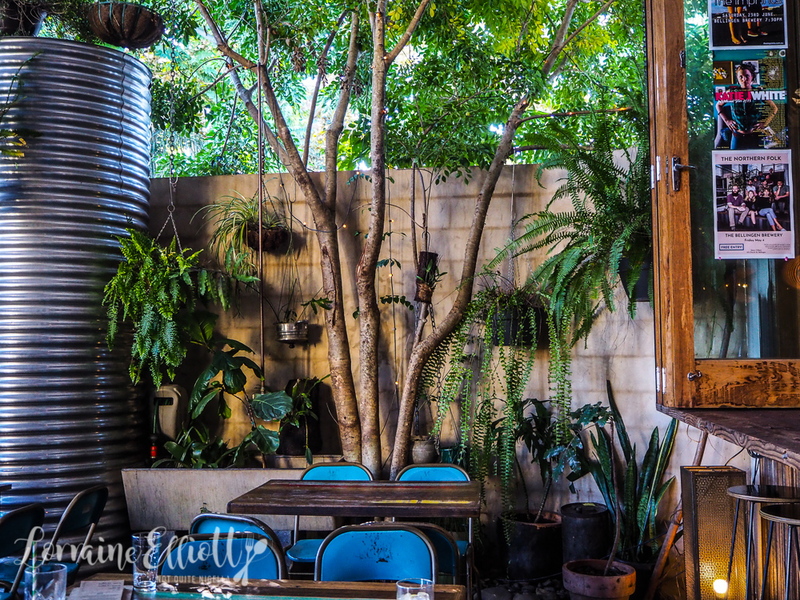 There is indoor and outdoor seating as well as function space. There are two large functions this evening so we are sitting in the front room near the bar. 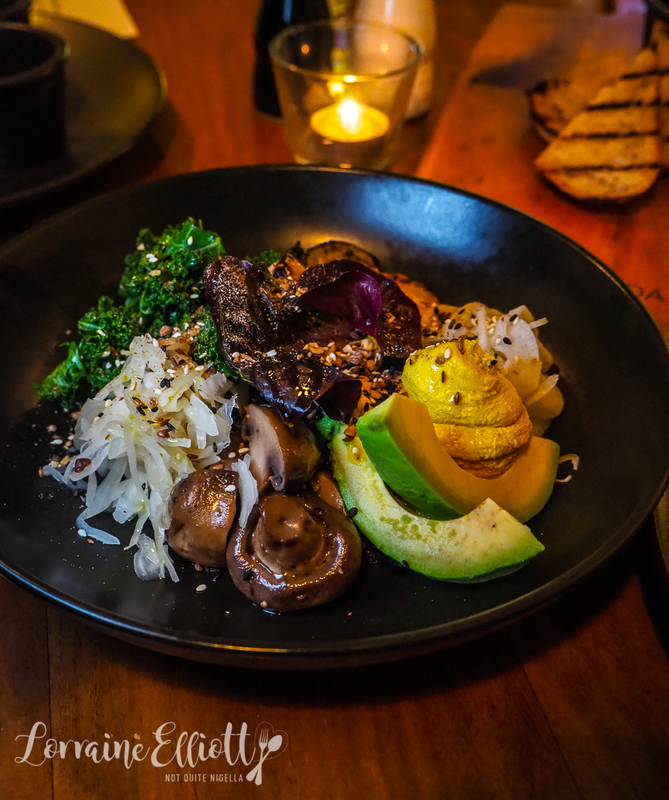 We start with the Bello bowl with mixed quinoa, fermented cabbage, pickled fennel, avocado, mushrooms, kale, roast pumpkin, house made cashew cheese and dukkah spices. It's a really tasty vegetarian or actually vegan bowl with plenty of flavour. 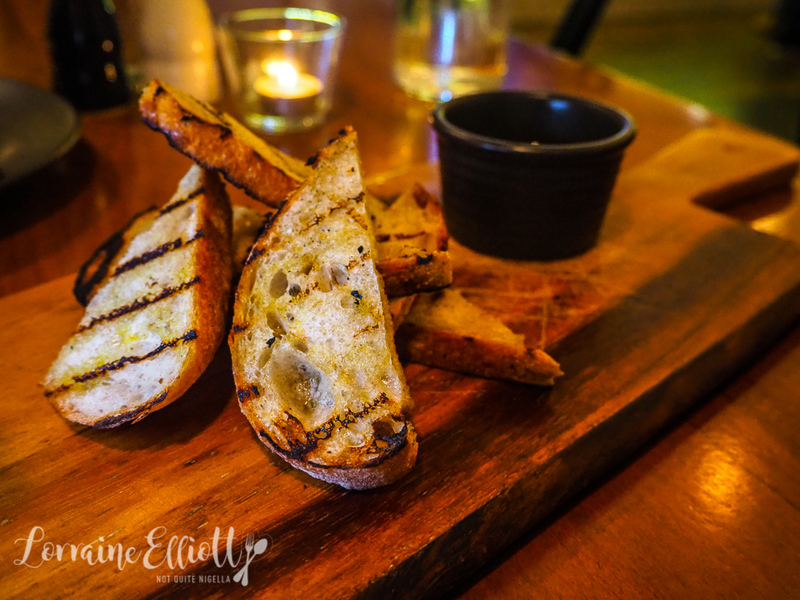 Bellingen locals have been eating vegan food for a long time and we have found the vegan offerings are better than usual. I ate more of these than I intended to. 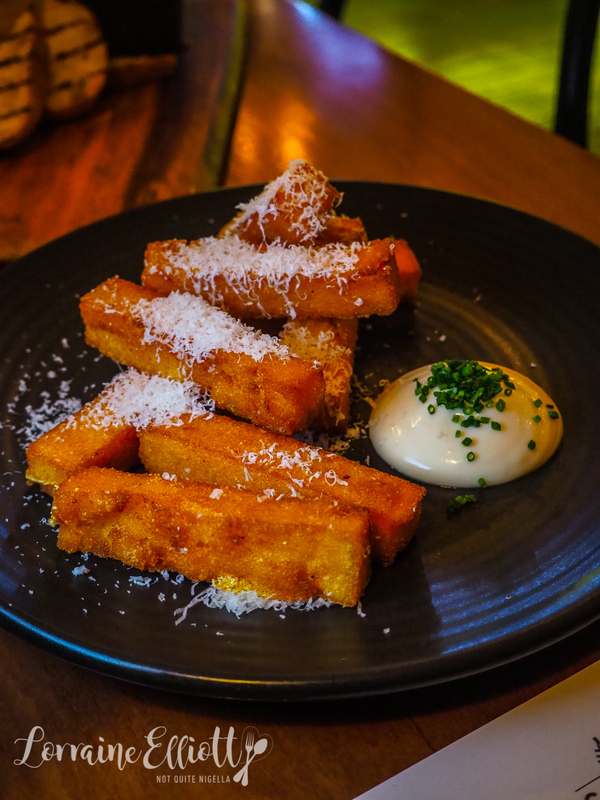 They're pretty damn addictive, especially when served with truffle aioli, chives and shaved parmigiano cheese. The salmon fillet has a nice crispy skin on top and is cooked til pink inside so it is a moist fillet. 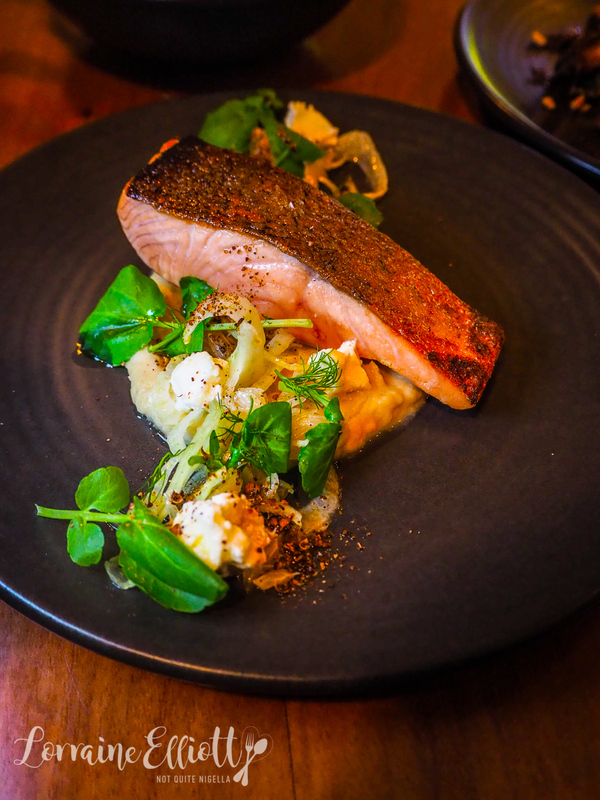 It comes with fennel puree and a tart salad of Promised Land pomelo, fennel, marinated goats feta and toasted coriander. The salad has a nice tartness to it from the pomelo and is seasoned well so that the whole dish sings with flavour. 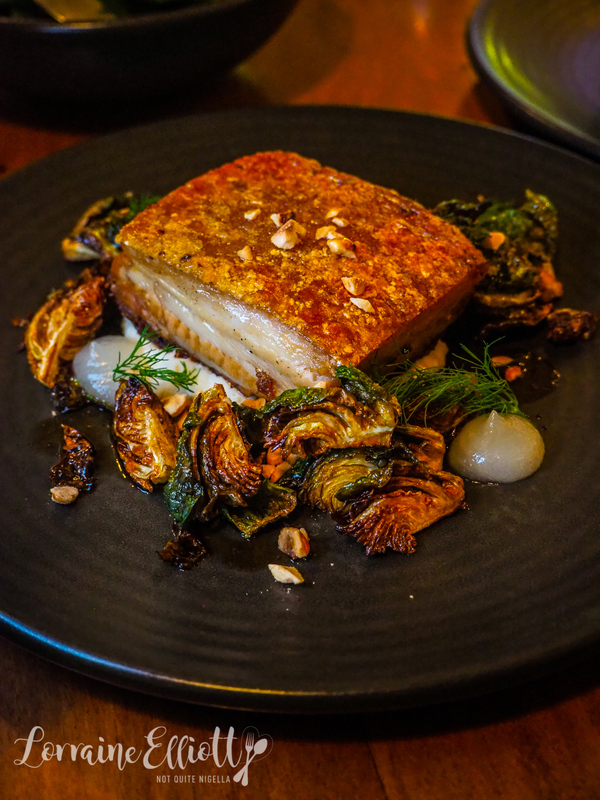 Dorrigo is a nearby town and the pork belly is a delicious square of soft, melting meat with celeriac, crispy Brussels sprouts, toasted hazelnuts, pear puree and jus. I particularly like the sweet element from the pear and the crunchiness of the hazelnuts with the soft pork. 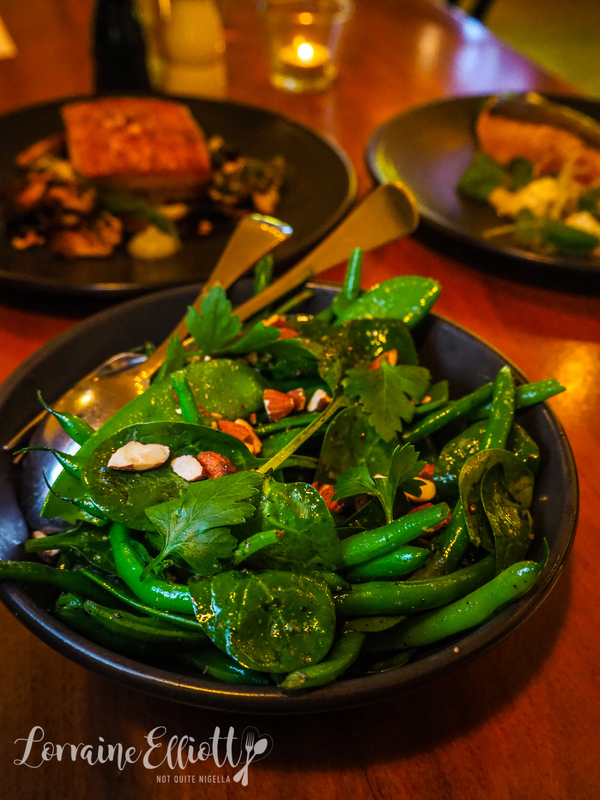 We love our veggies and we devour the crisp, buttered greens with roughly chopped toasted almonds. Dessert time! 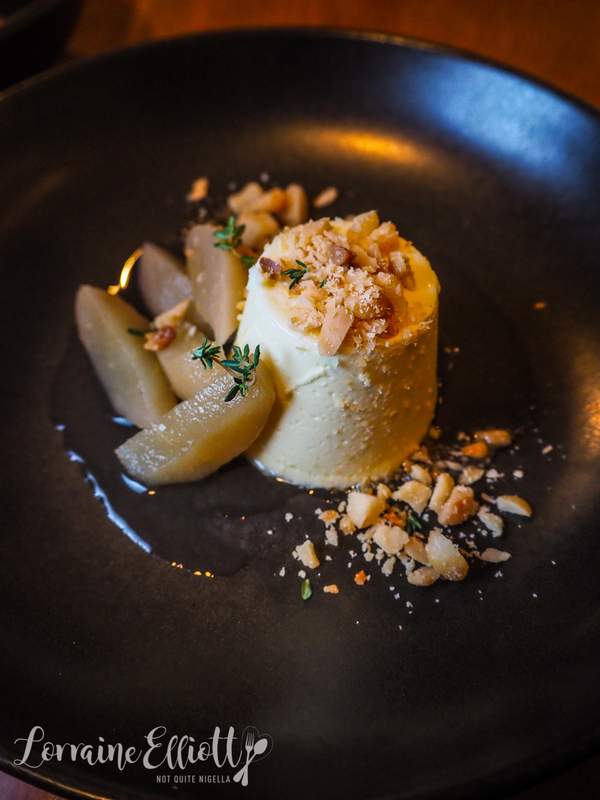 Our first choice is a vanilla panna cotta paired with Raleigh honey (a nearby town) poached pears and roasted macadamias. The lemon thyme and honey is a wonderful combination, the honey really being the predominant flavour. 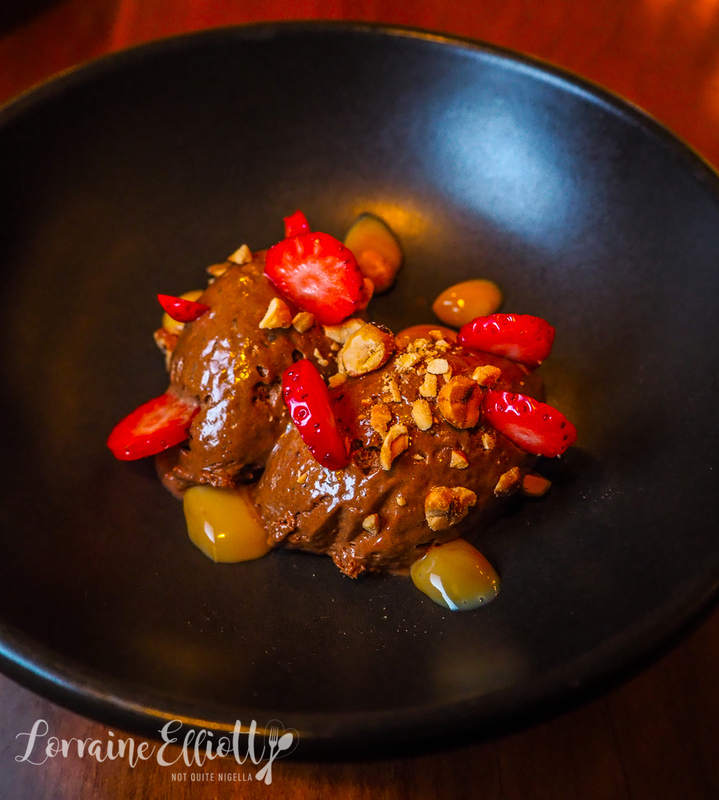 Although I don't usually go for chocolate after a big meal, I love the light appeal of the Belgian chocolate mousse with dabs of dulce de leche, crunchy toasted hazelnuts and sliced, macerated strawberries. The hazelnuts and dulce de leche really give it texture while the strawberries lighten each bite. The rest of Saturday night is spent back at the chalet singing and dancing to songs on Spotify (well that's just me, Mr NQN read a book). The next morning we start our trip back home. There's a little detour to the town of Sawtell about 45 minutes drive away down lush green curvy roads. Mr NQN has fantasies of being a rally car driver so he chooses this route. We emerge from the leafy forest foliage to find ourselves in Sawtell. 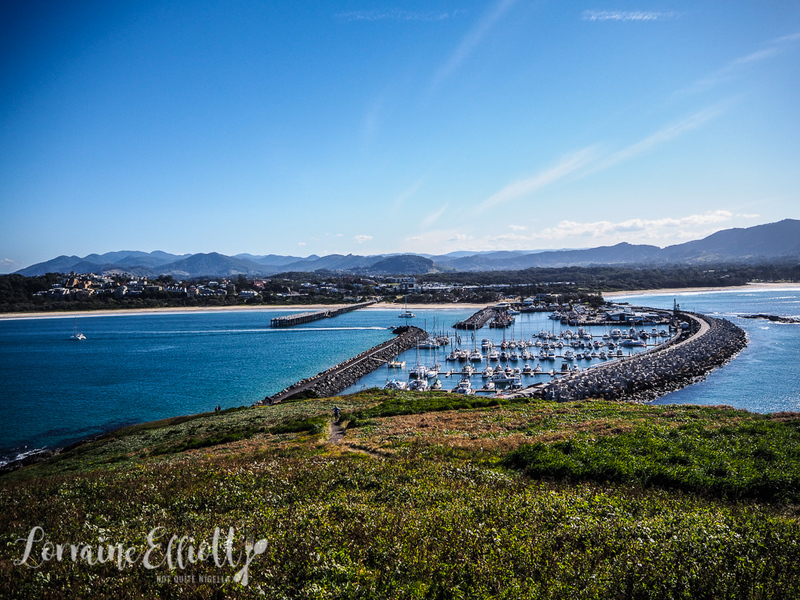 It's a sweet town with a pretty beach and a Northern Beaches vibe. People are busy sunning themselves on this unseasonably warm winter's day watching whales in the distance - one needs only watch the water for a minute or two before seeing a whale breaching in the distance. We pop into the local Art Deco theatre, a restoration funded by the community. 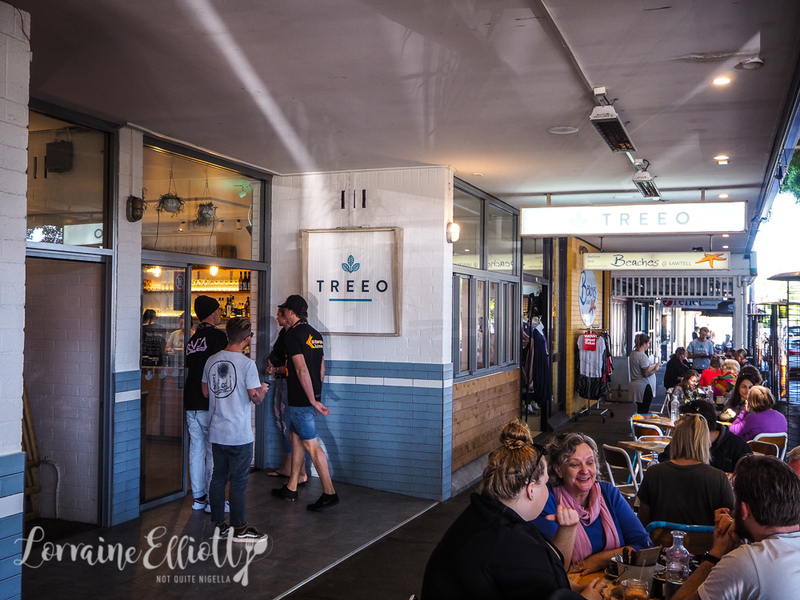 Brunch is at Treeo cafe, a popular spot run by Leesa and Duncan Elliott (no relation hehe!) 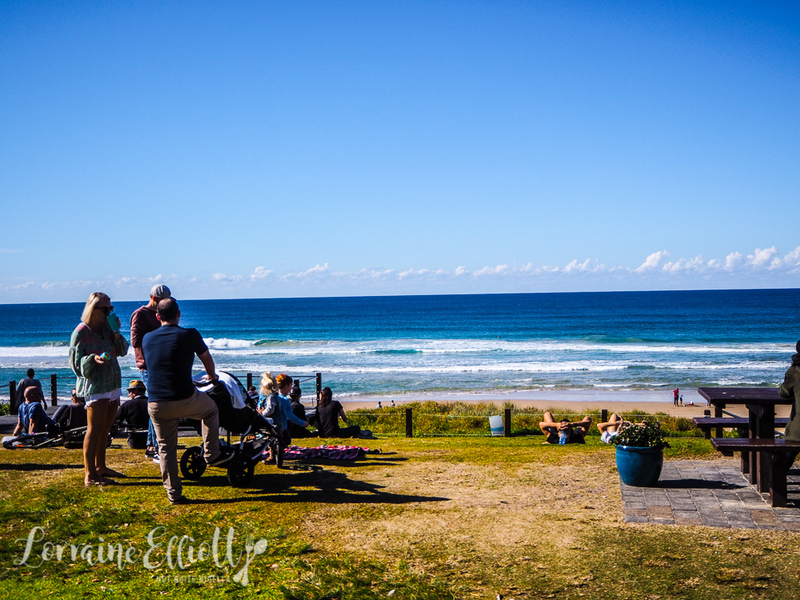 who made the change from Sydney to Sawtell a few years ago. Treeo refers to the three of them that moved here although their family has expanded to five. 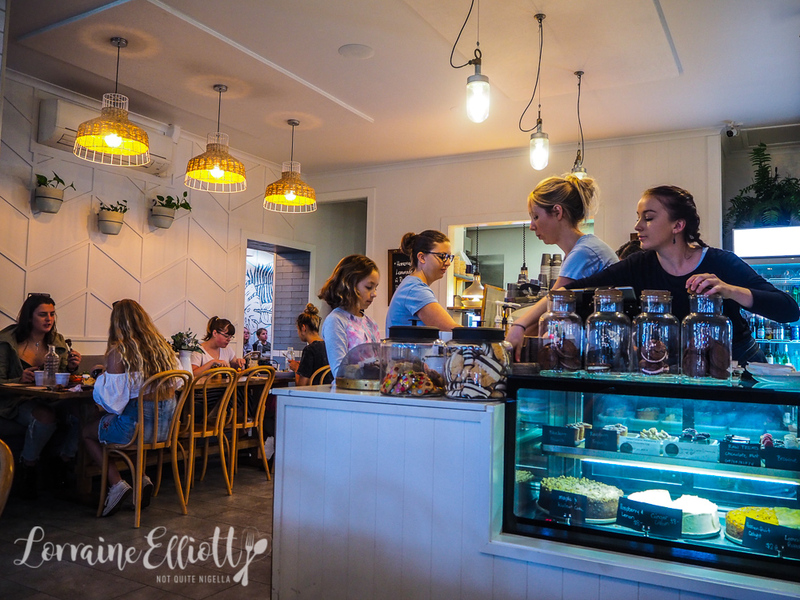 The menu is very much on trend with poke bowls, matcha lattes and butterbings on offer. 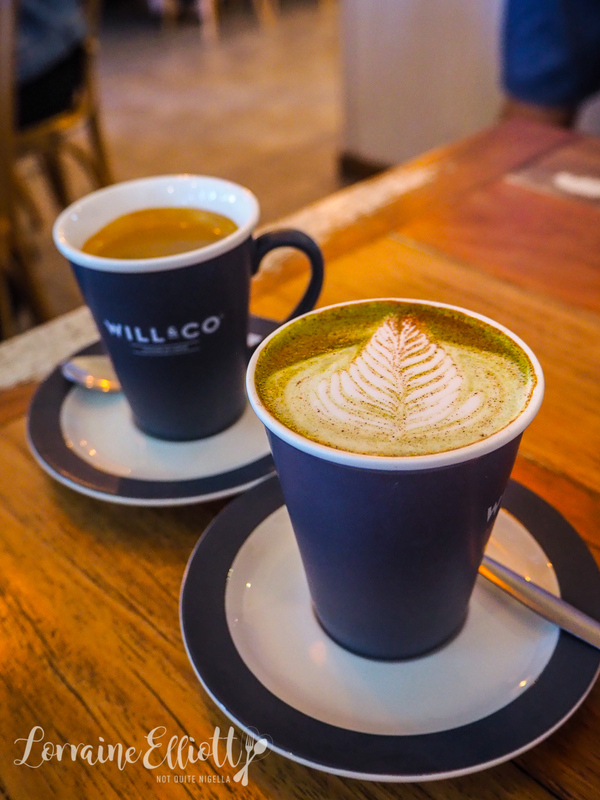 We start with a matcha latte and a long black as well as a mango coconut smoothie and a big banana smoothie. 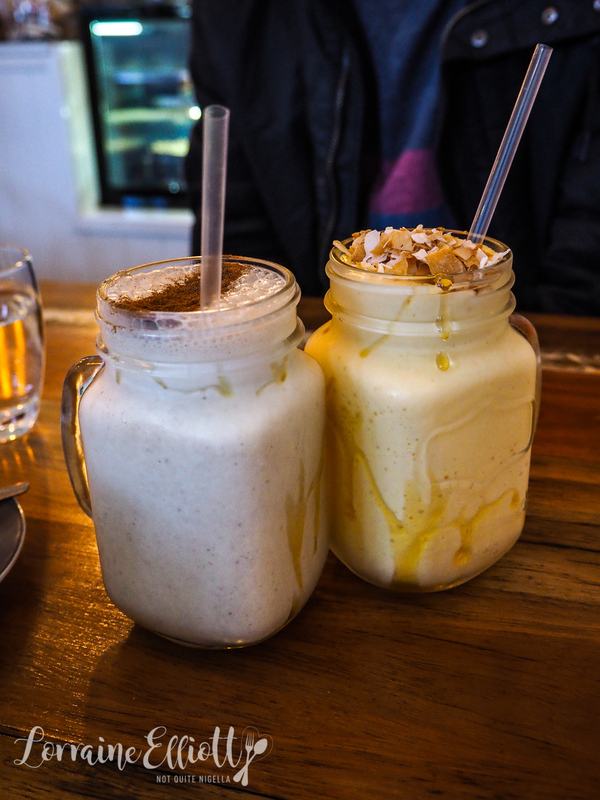 Usually I'm not a huge smoothie person as I find them a bit filling (but Mr NQN adores them) but I am rather taken by the big banana with fresh bananas, almonds, honey, cinnamon, ice cream and milk. 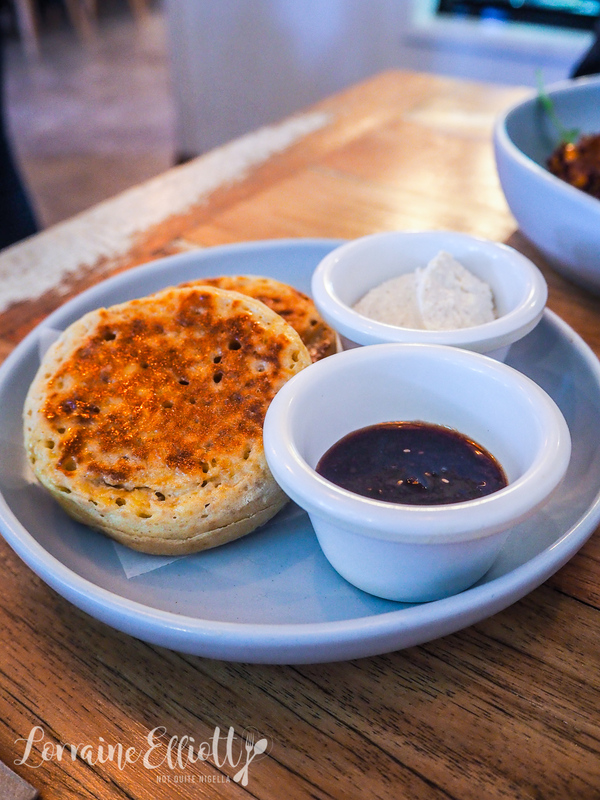 The sourdough crumpets are more for greed than need. They come out as two thick, dense tangy crumpets paired with a nice housemade strawberry chia jam and whipped ricotta cream on the side. We adore the corn fritters that come three to a serve. They're packed with plenty of corn and are crispy on the outside. 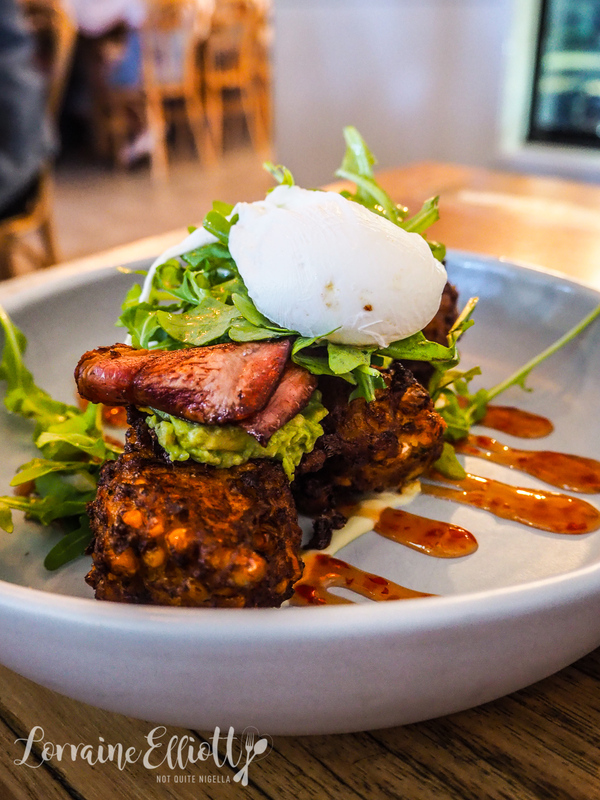 The are served with crispy bacon, avocado, sweet chilli relish, sour cream, poached egg and rocket. 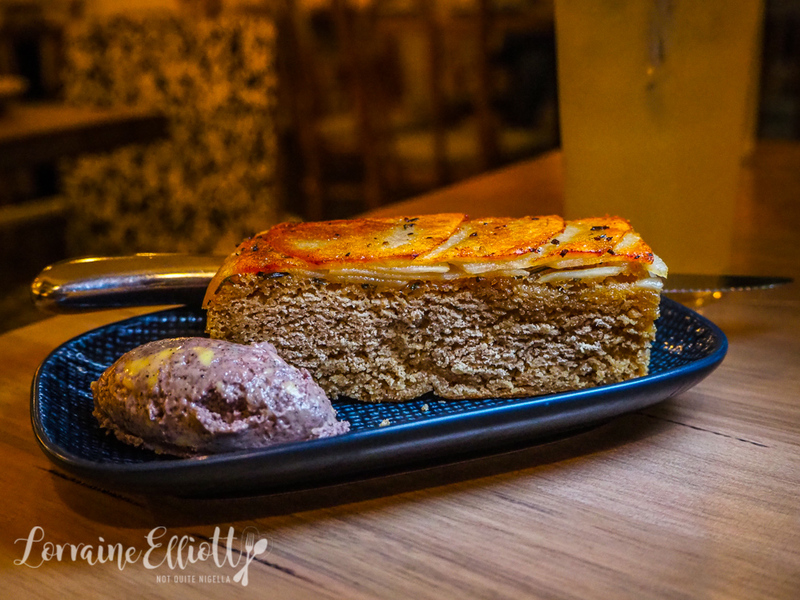 It's a delicious combination of textures and flavours. 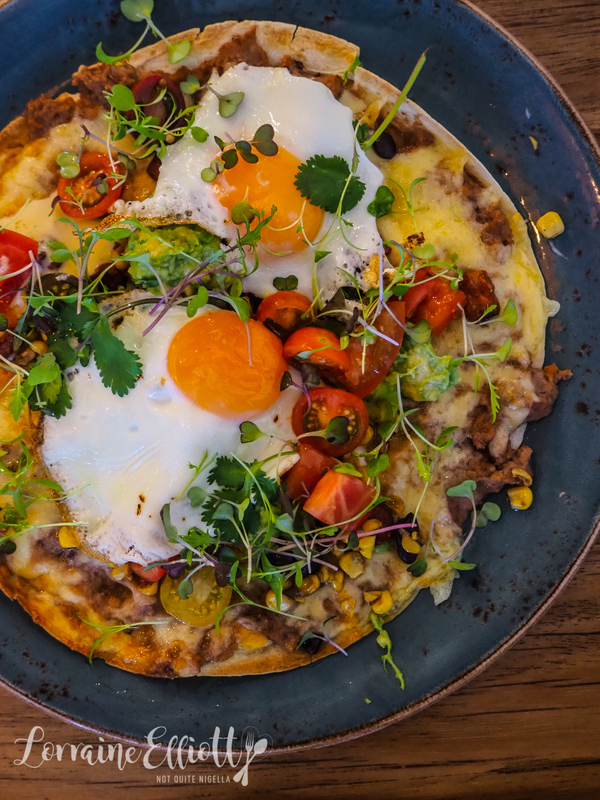 The huevos rancheros are a soft flour tortilla topped with melted cheese with chunks of spicy chorizo, corn, tomato salsa, avocado, sour cream, refried beans and jalapenos with a fried egg on top. All it needs is a bit of Tabasco and it's breakfast perfection. I can't resist cake - that's the only problem sitting opposite the cake display. 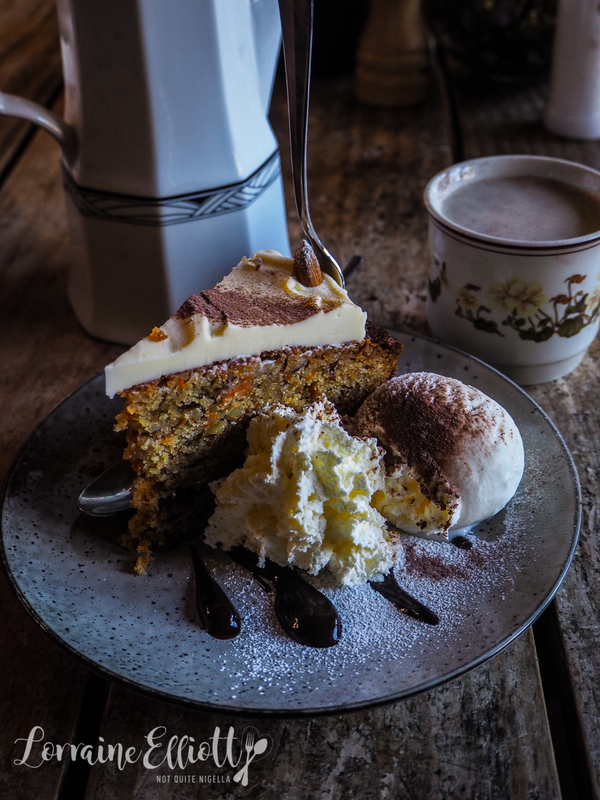 The ginger and coconut cake is made for Treeo by a local woman and it's absolutely wonderful. Strong in ginger flavour with texture from shredded coconut and a ginger cream cheese frosting I finish it all. I really must have worms or something. We are flying back to Sydney from Coffs Harbour airport so we head towards Coffs Harbour. 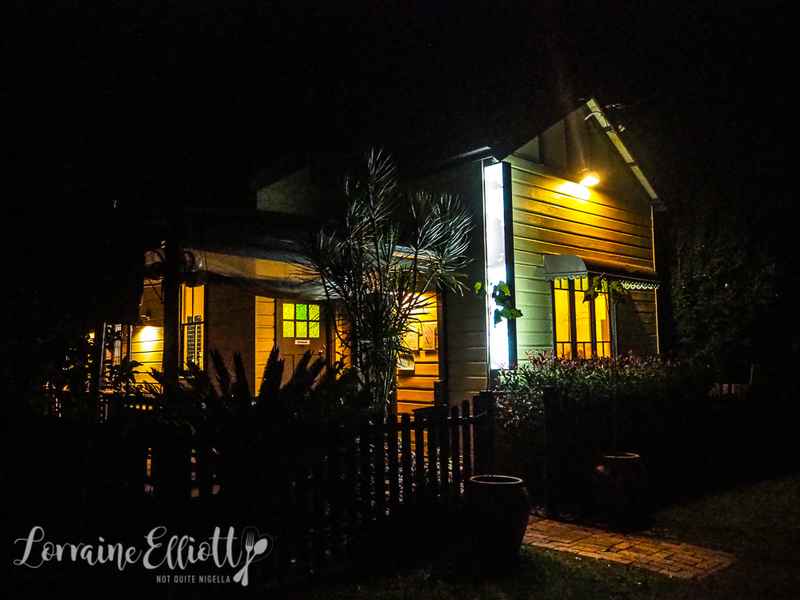 It's 10 minutes drive from Sawtell and it is where Mr NQN grew up so it is full of memories for him. 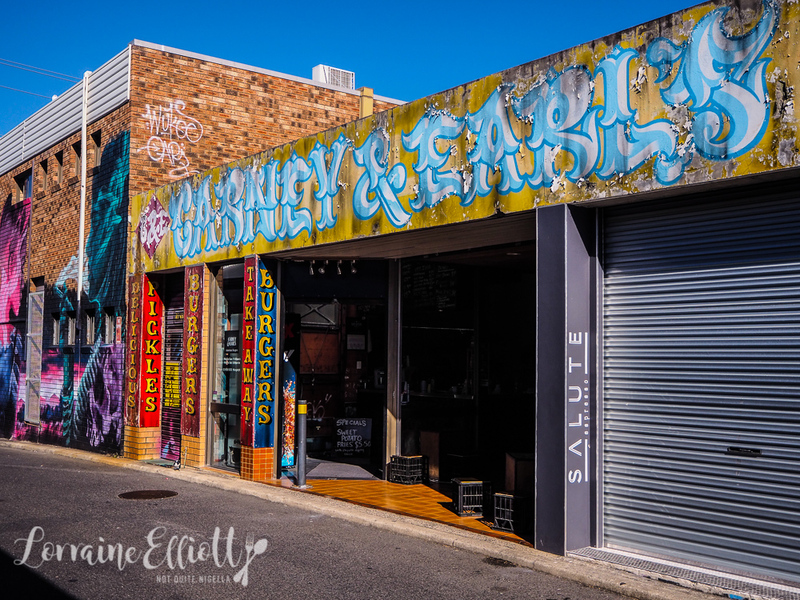 We were tipped off about an interesting burger place in Coffs Harbour called Carney and Earl's. 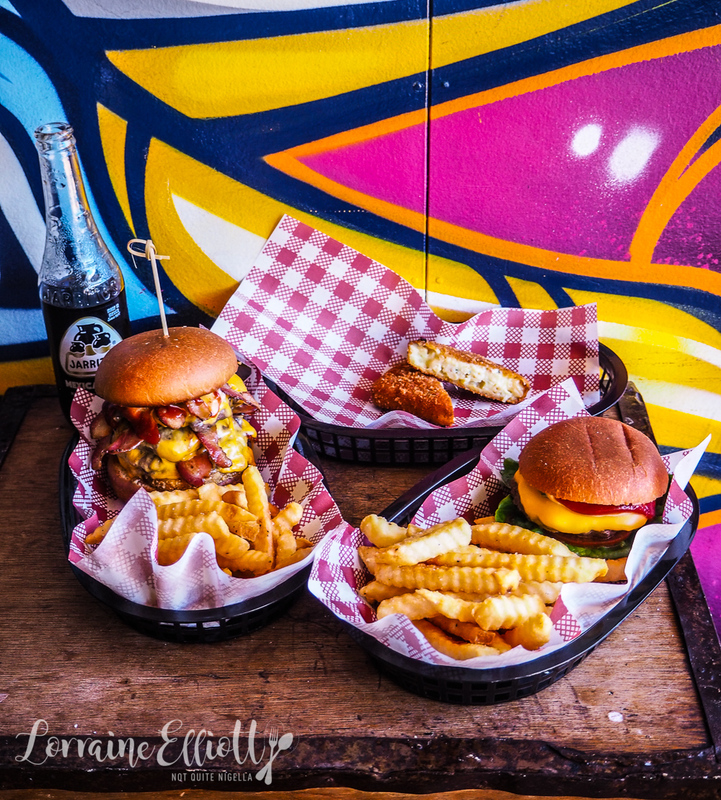 Located in a nondescript alleyway you grab a milk crate to eat your burgers. They use grass fed beef in their burgers and all of their patties are sous vided before being finally finished on the grill and served medium rare. The brioche buns are from France. 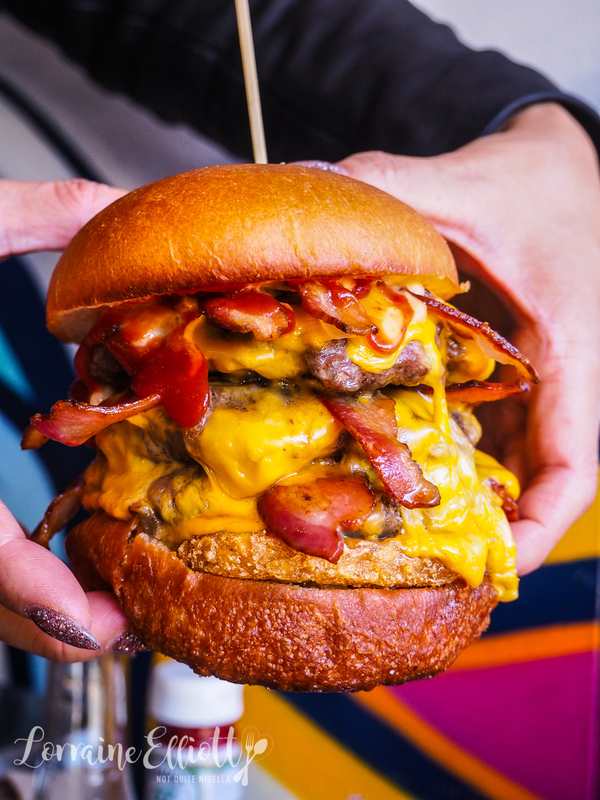 I must be demented but I'm tempted by the widow maker-it's three patties, three loads of bacon, three pieces of cheese and a hash brown. And there's a couple of slices of pickle in there somewhere too. First things first: it's a super rich burger but I probably didn't have to point that out to you. It's also pretty impossible to fit in your mouth unless you were blessed with a jaw that unhinges. I personally love salad on burgers as they are too rich without them but I don't think that this is the point of a Widowmaker nor would it fit. We wash this down with a Jarritos Mexican cola. 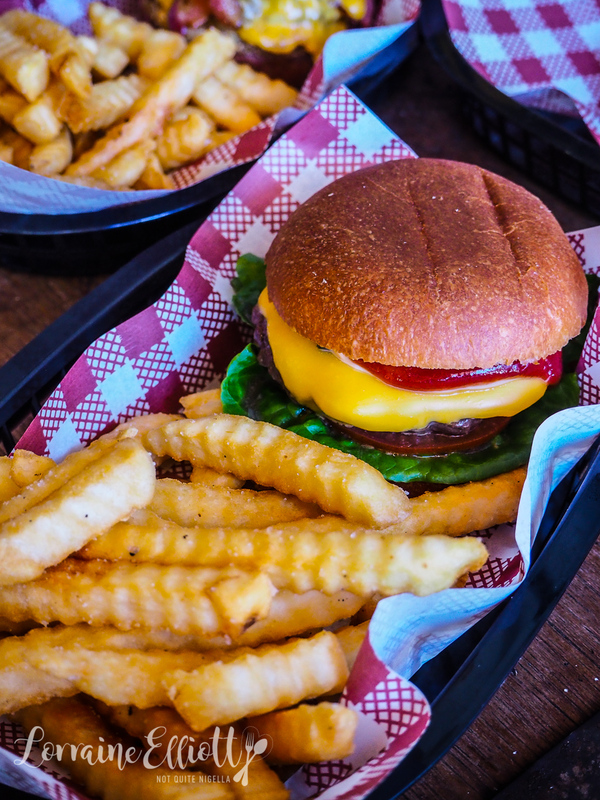 The Carney burger with a single patty and salad is picture perfect. In fact I stare at it for a bit wondering if it is real with the perfect round of lettuce on it. There's a mayonnaise, tomato sauce, tomato, lettuce and a beef patty. It's pretty good too although I prefer milk bun and brioche buns can be a bit dry. I do love the crinkle cut chips though. 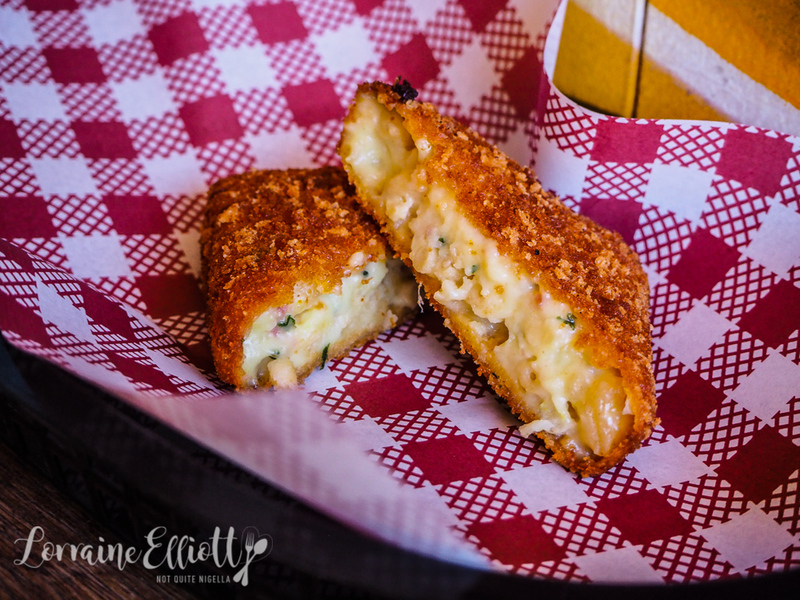 And for the side we try the mac and cheese bomb which is rich mac and cheese shaped into a square, breaded and deep fried. And yep it's pretty damn good. So tell me Dear Reader, what are the qualities of your favourite towns? 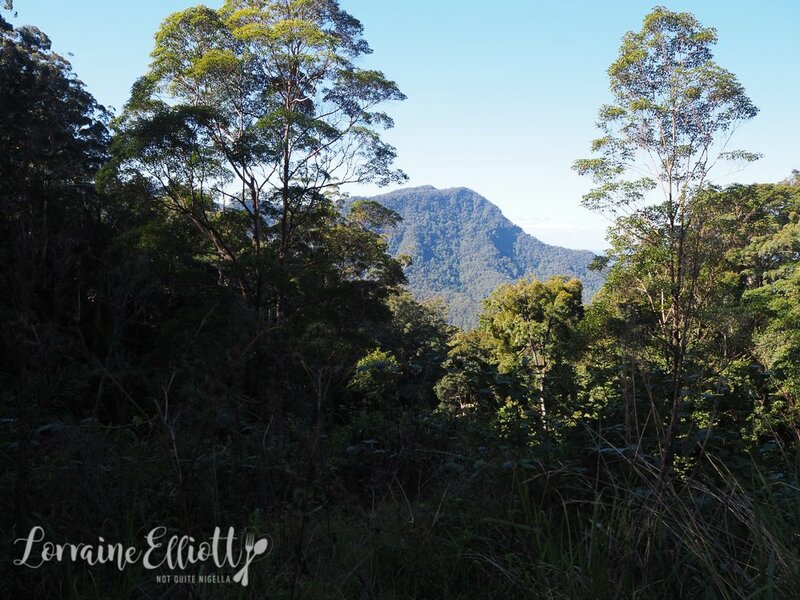 Have you ever been to Bellingen and if so, what did you think of it? Do people ever ask if you have worms or remark on how much you eat? This post was brought to you by Visit NSW.